From the Imperial War Museum, May 18, 1918. 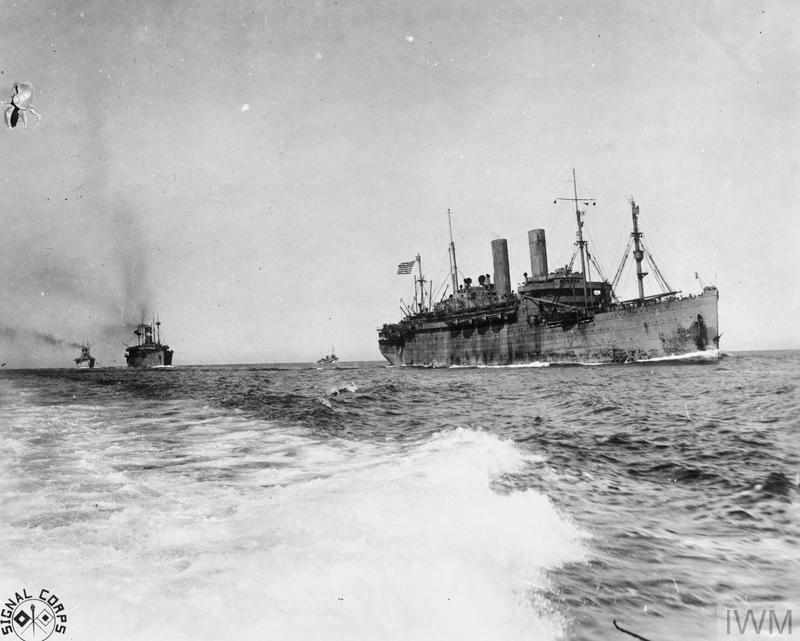 Convoy of American troopships at sea on 18 May 1918, led by the USS GEORGE WASHINGTON, USS AMERICA, and USS DR KALB. Photograph taken from aboard USS WHIPPLE. 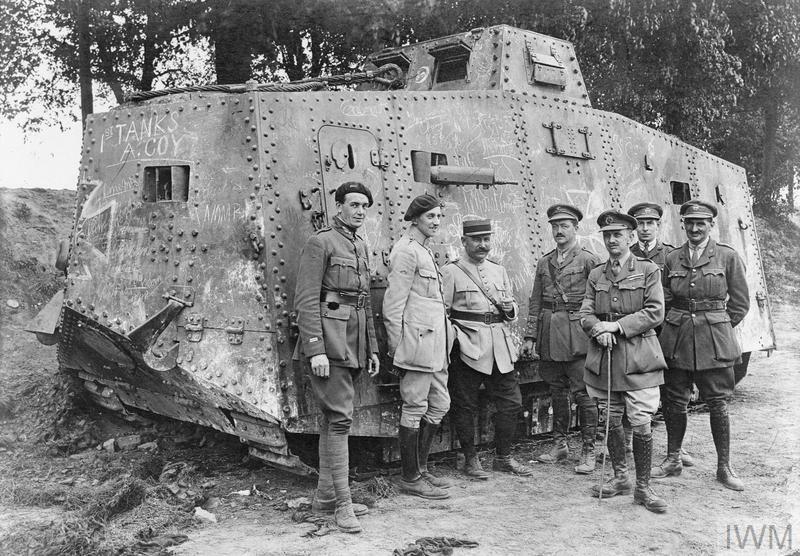 French and British officers by the German A7V tank "Elfriede", captured near Villers-Bretonneux on 24 April 1918. Saleux, 18 May 1918. Battle of the Lys: A British sentry beside a foot bridge over the Lys Canal at Saint-Floris. 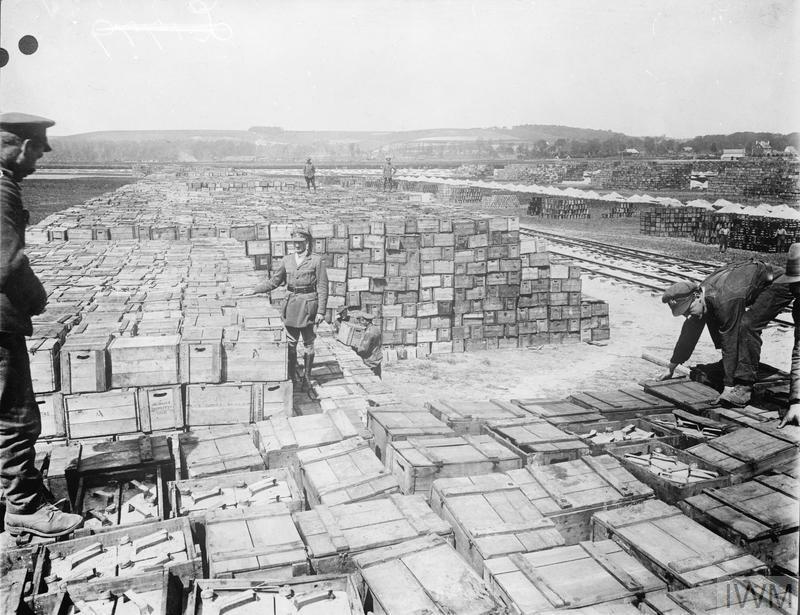 Tins of petrol are on hand for burning the bridge should it be reported that the Germans are advancing nearby, 18 May 1918. (The Germans did not reach St Floris). 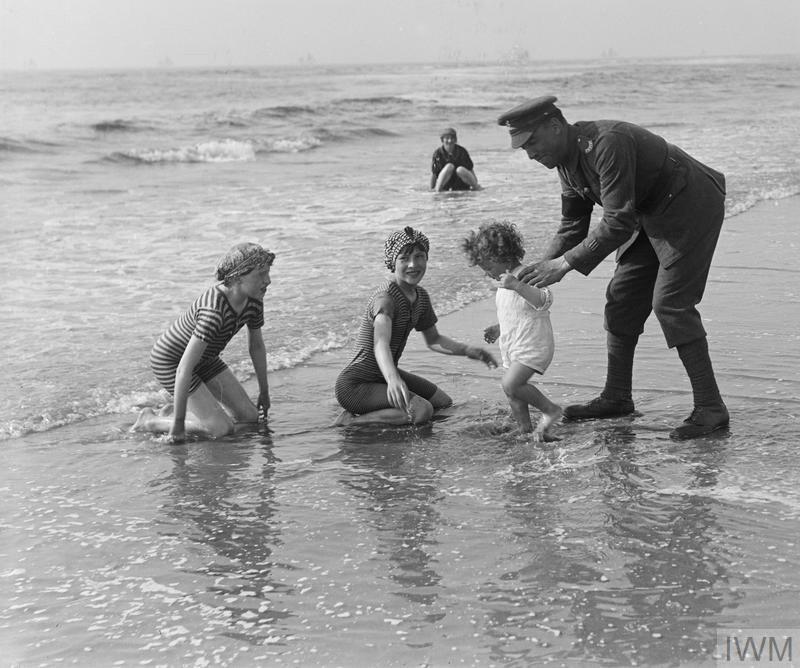 Soldier of the Royal West Kent Regiment, attached to the Military Police, playing with French children on the beach at Paris-Plage, 18 May 1918. 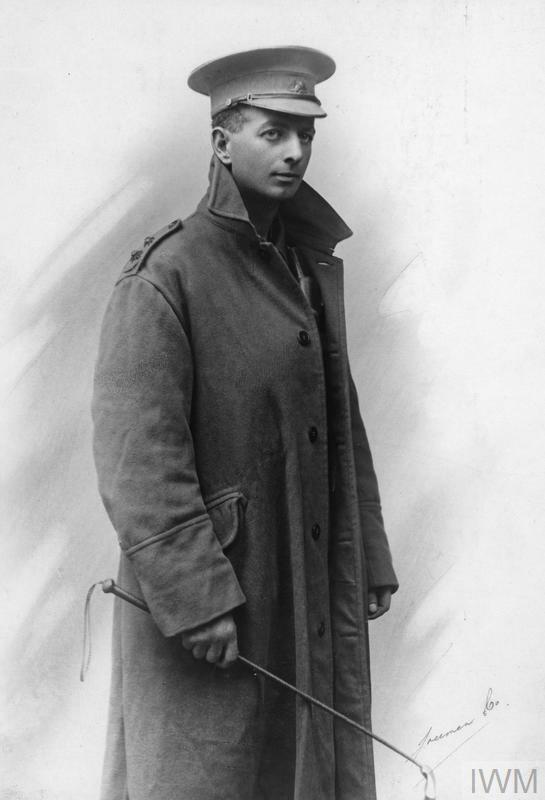 Lieutenant Edmond William Claude Gerard de Vere Pery. Unit: Warwickshire Yeomanry, attached to No. 32 Squadron, Royal Air Force. Death: 18 May 1918, Western Front. Eldest son of William Henry de Vere Sheaffe Pery, 4th Earl of Limerick, of Dromore Castle, Pallaskenry, Co. Limerick. Educated at Eton. From the Imperial War Museum, May 19, 1918. 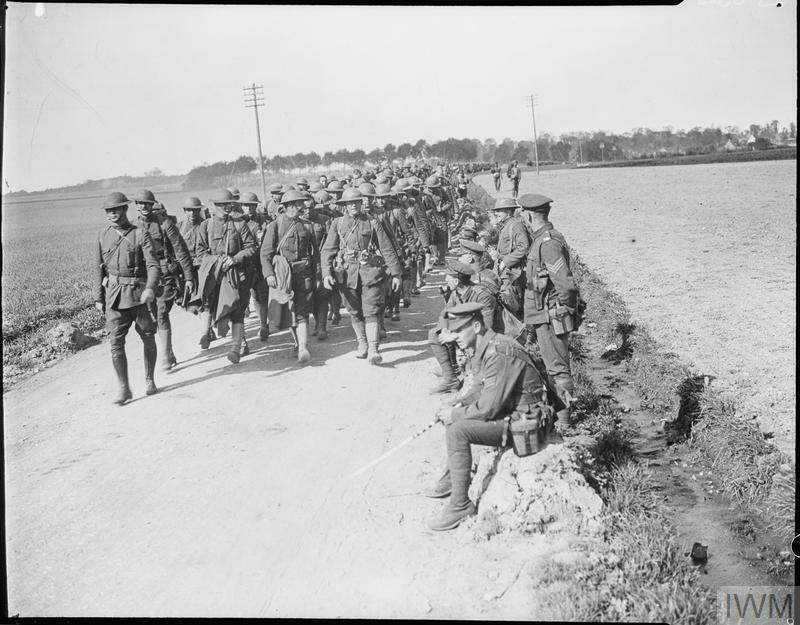 Troops of the 305th Machine Gun Battalion (77th American Division) on a route march at Watten, 19 May 1918. 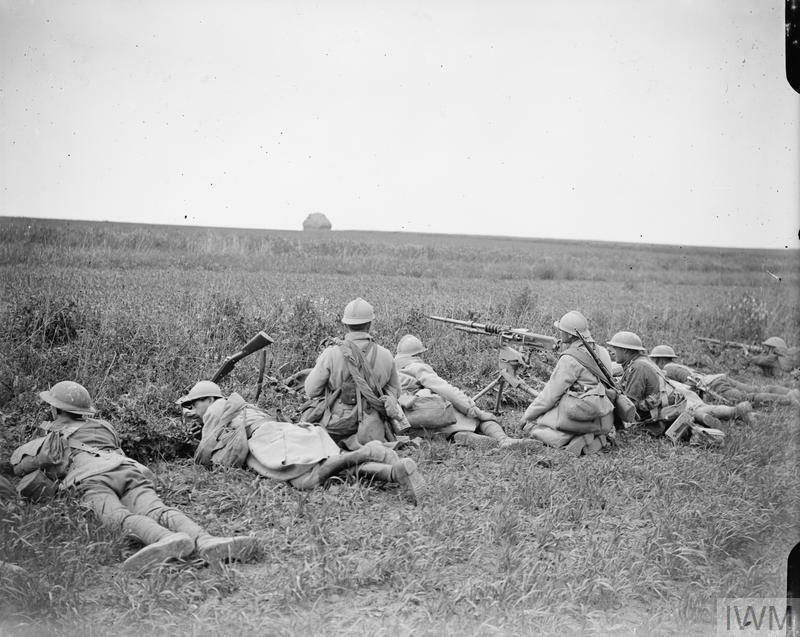 They are passing by British troops (probably of the Machine Gun Corps) sitting by the roadside. 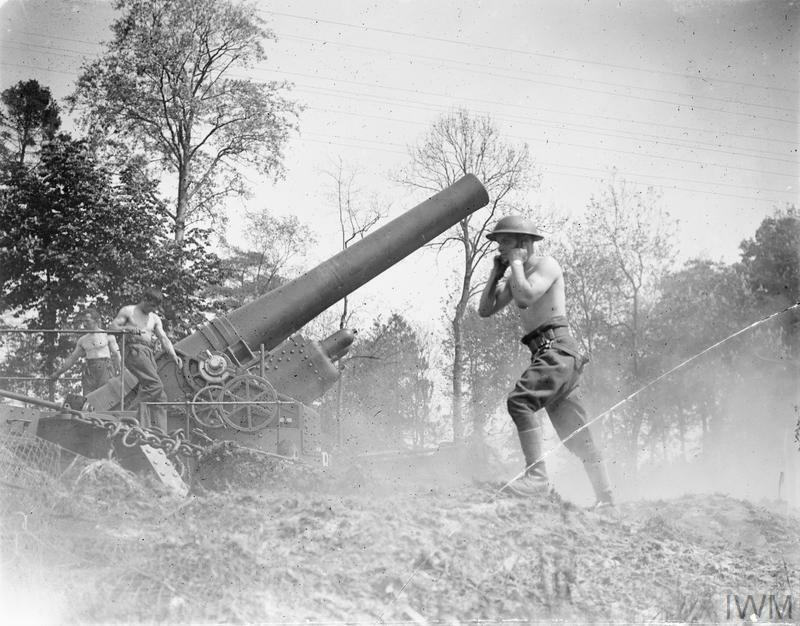 12-inch gun (named "Bunty") of the Royal Garrison Artillery firing at Louez, 19 May 1918. 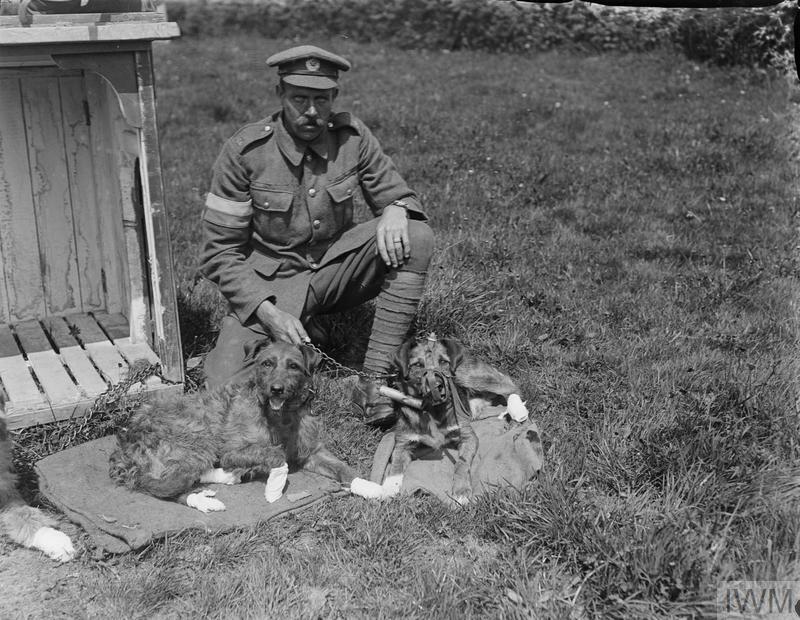 Dog handler of the Royal Engineers (Signals) with his messenger dogs at a Army Veterinary Corps HQ Kennel near Nieppe Wood, 19 May 1918. Note the dogs feet, bandaged as a result of injuries caused by mustard gas. 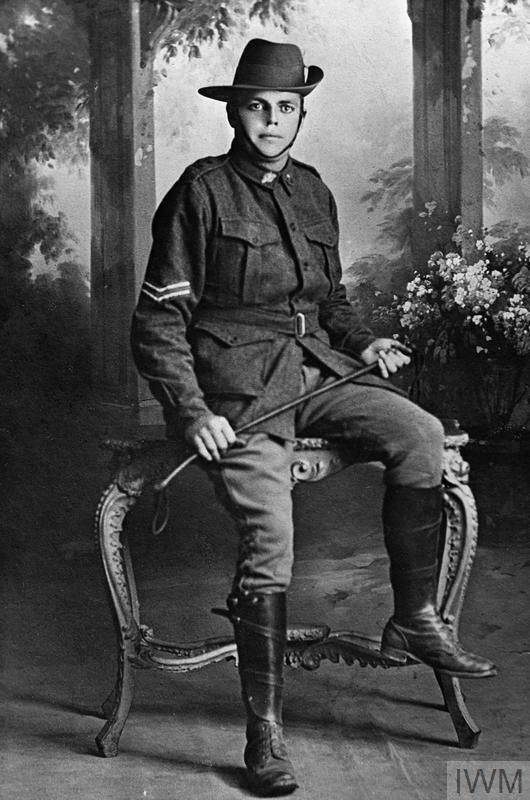 Lieutenant Colonel Charles Kenneth James DSO and Bar. Unit: 6th Battalion, Border Regiment. Death: 19 May 1918 Western Front. Son of Dr. C. A. James, of The Pollard Elms, Upper Clapton, London; husband of Phyllis D. E. Cursham (formerly James), of The Manor House, Thrumpton, Derby. From the Library of Congress. 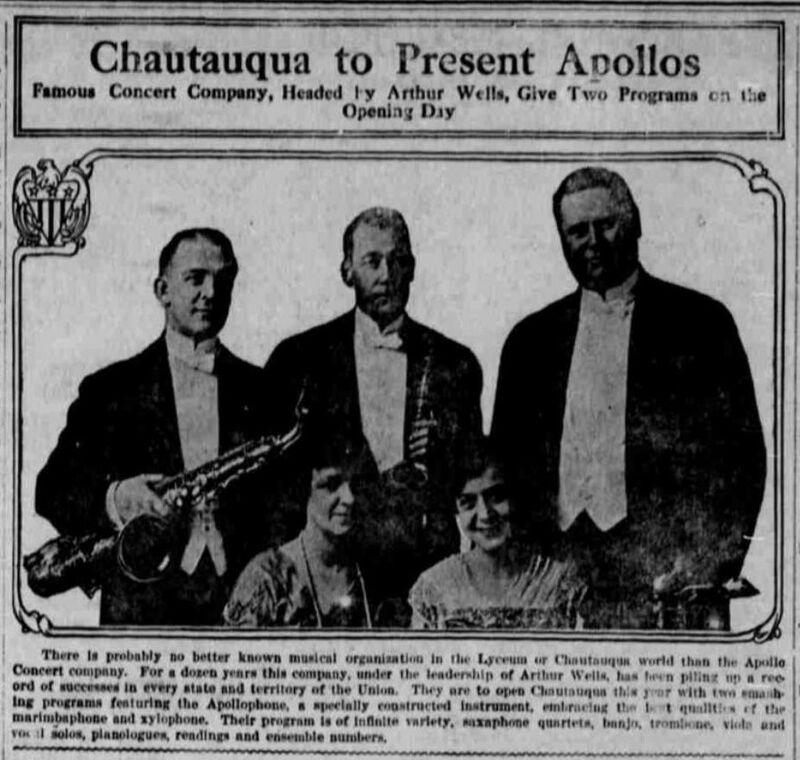 The Rogue River Courier, (Grants Pass, Oregon) May 19, 1918. I received two letters from you last Saturday. I have just finished my supper and washed my dishes. I am getting fatter everyday. The britches that I wore in the states were just right for me, and now they are about 3 inches too small around the waist. We have had some rainy weather here the last week. But it looks as though it might clear up now. I guess spring is here, the flowers are blooming and the fruit trees are nearly all in bloom. I went into a town last Sunday and bought some souvenirs to bring home. I also had my picture taken. But have not got them as yet. Will send some home when I get them. I am sending Peggy a handkerchief in this letter that I bought. I have a few more things but don't want to take a chance of sending them over, so will bring them when I come back. I have a pair of wooden shoes also for Peggy. Nearly all the people over here wear them. They look funny as the devil. I saw a man with a pair on and they must have been 18 inches long. You can hear them coming from a mile away. Well it is getting nearly time for taps and I will have to make my bed yet tonight so I will ring off here. With lots of love to all. From the Imperial War Museum, May 20, 1918. 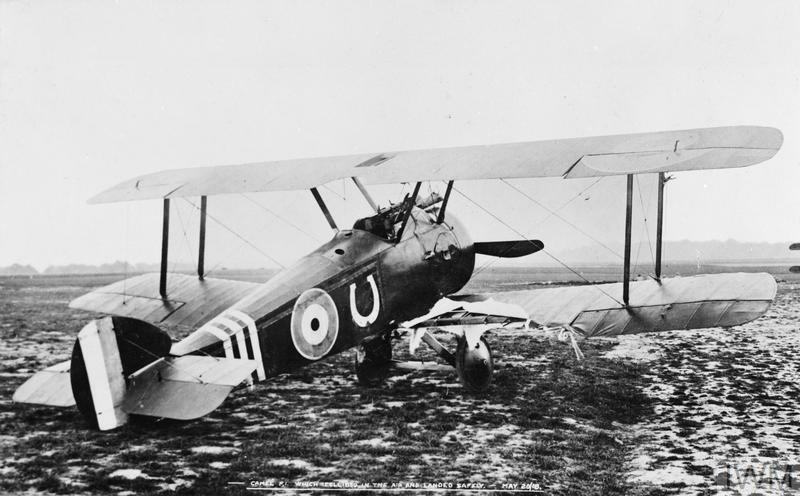 Sopwith F.1 Camel single-seat fighting scout biplane. 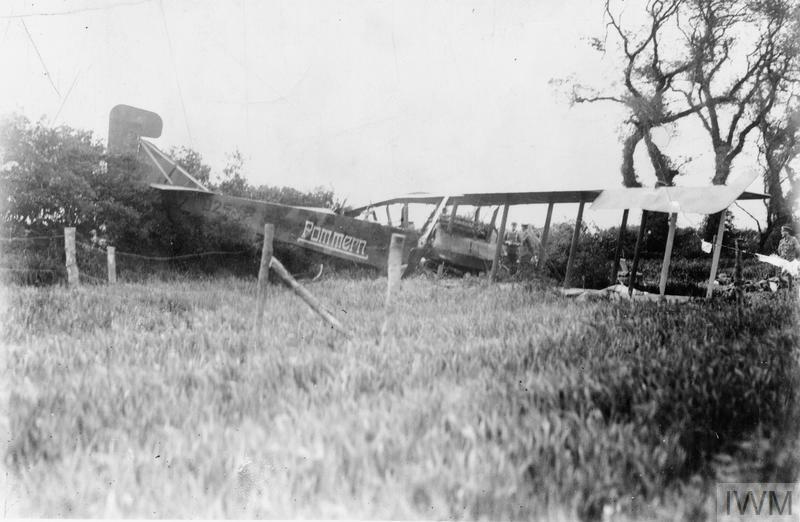 Damage to wing caused by a mid-air collission. 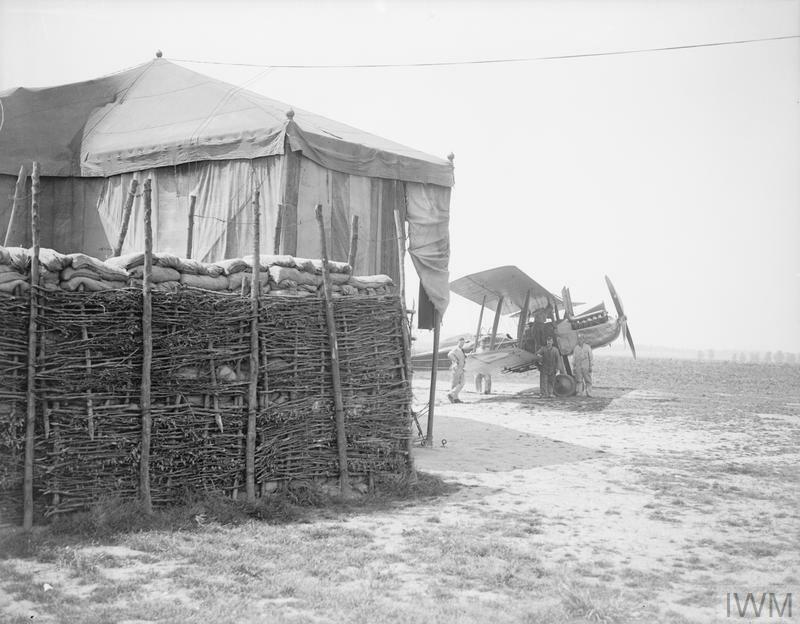 Air mechanics of the Royal Air Force tuning up a Royal Aircraft Factory B.E.2c biplane at Acq Aerodrome, 20 May 1918. Note a splinter-proof revetted sandbag wall in foreground. 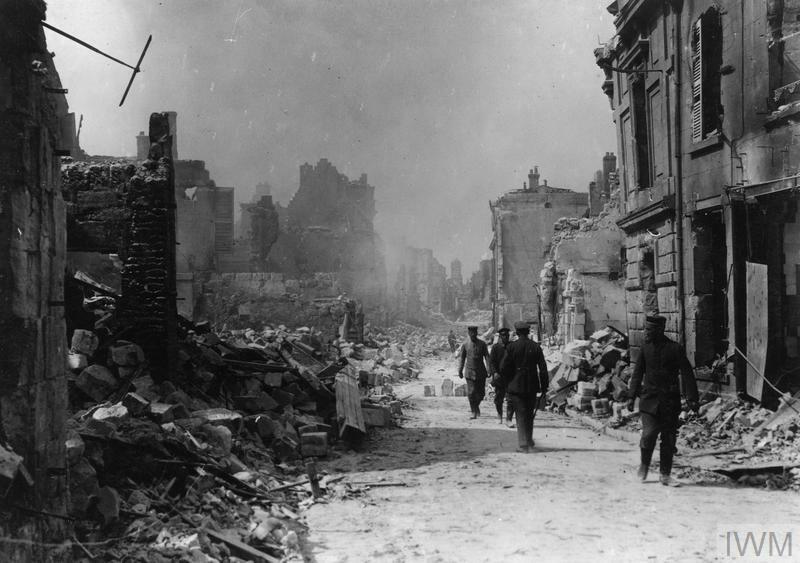 Ruins in the rue de Sadi Carnot, Bethune, 20 May 1918. 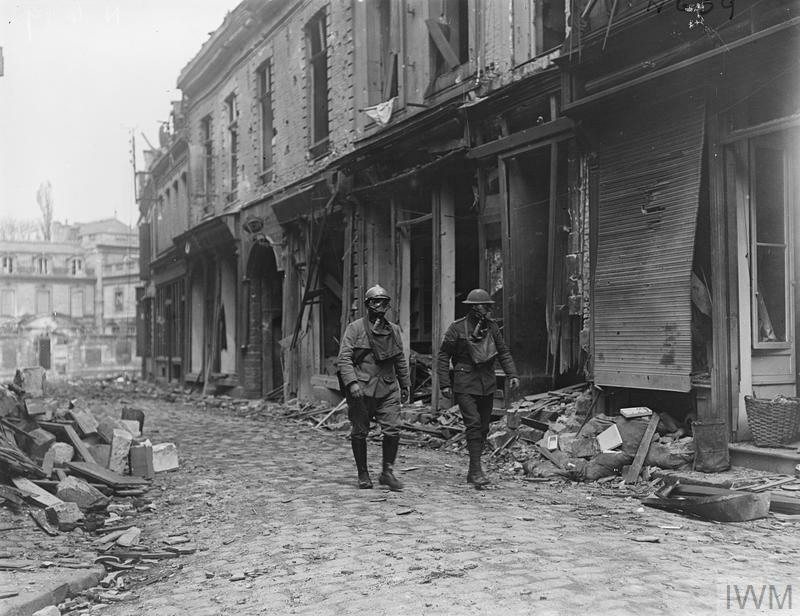 French and British military policeman on patrol in the ruins of Bethune, wearing gas-masks, 20 May 1918. 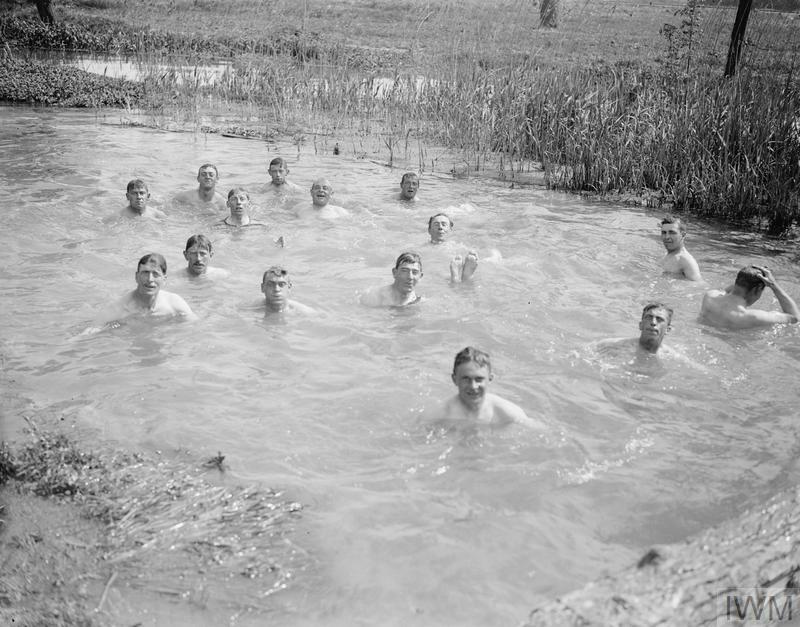 Soldiers bathing in the river at Maroeuil, near Arras, 20 May 1918. Private Charles Edward Young 8269. Unit: Australian 5th Pioneers, Australian Imperial Force. 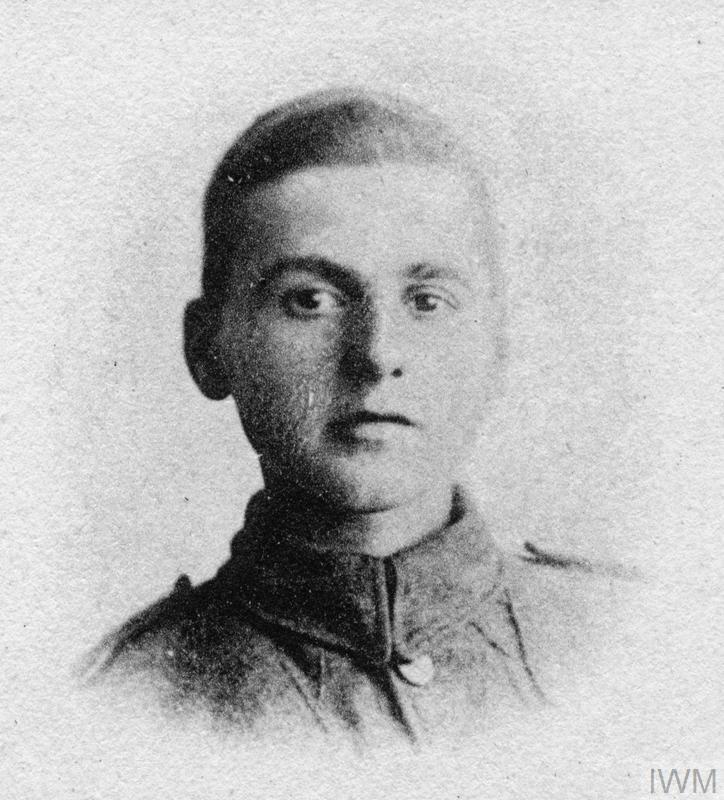 Death: 20 May 1918 Killed in action Aged 25 Western Front. Grave/Memorial Ref: D. 10.Aubigny British Cemetery. From the Library of Congress, May 20, 1918. 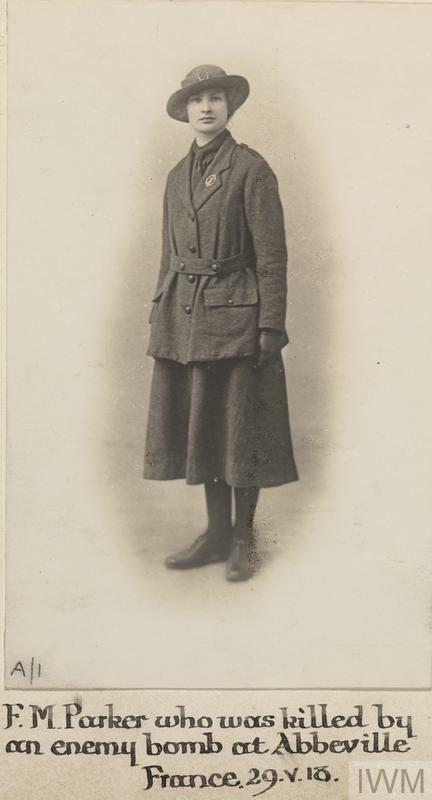 Edith Randall, 19 years of age, who was employed in the home of W. S. Larsh, mine superintendent at Ruth, attempted to commit suicide last Sunday evening by shooting herself in the left breast with a 22 caliber target pistol. Immediately after the shooting the young girl was removed to the Steptoe hospital in East Ely where an operation was performed by Dr. Bowdle and the violent hemorrhage resulting from the wound was stopped. She is still at the hospital in a very precarious condition. An unfortunate love affair is said to be the reason for the attempt at self destruction. George Emery Freeman, a well known rancher living six miles east of town in the Harmon district, died Monday of tetanus, following blood poison induced by running a rusted nail in his foot some time ago. Mr. Freeman suffered greatly from the effects of the poison and death came as real relief. Joe Sabon, who had been a resident of Tonopah for many years, and who was visiting his brother, Louis Sabon, at Ruth, died Wednesday from miner's consumption. George Nodin, an old-timer who has been at the county hospital for some years, is in a very feeble state and his demise is looked for any hour. His only relative known is a seventeen year old son who works for the Western Union. 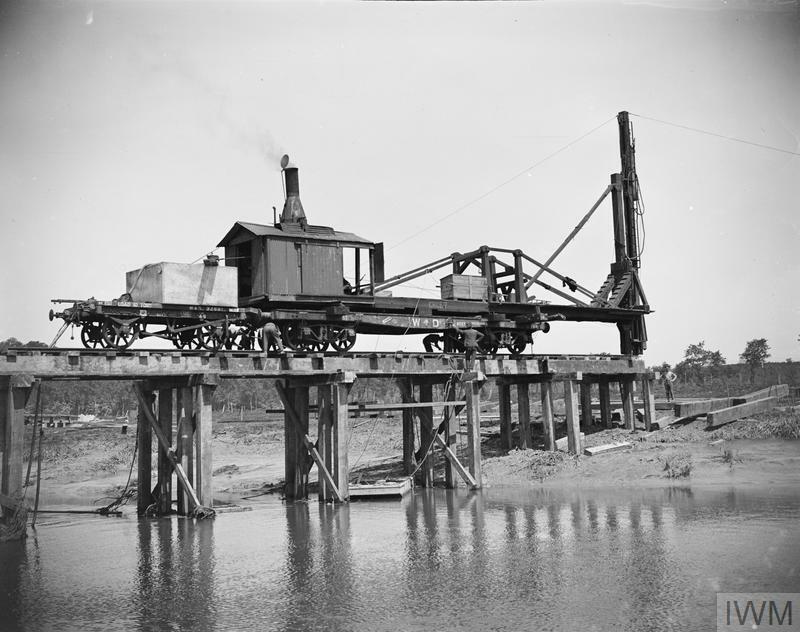 O'Brien Bukavlch, employed in the Desert Queen workings of the Jim Butler mine, was removed to Reno in care of Mrs. Church for special treatment. Bukavlch was caught in a rock slide last Friday. Well, this will probably be the last letter you will receive from me from here, as we are confined to camp waiting for orders to sail, which we expect to get Wednesday. The brigade will go by rail from here to Hoboken, N. Y., and sail from there. It is not a surprise, as we have had our sailing instructions for some time now, and our full equipment. It sure is a relief to know what we are going to do, and about when. It may take two or three weeks to make the trip, so if you do not hear from me or receive the card I spoke of in my last letter, do not be worried. You may expect it in about three weeks or a month from the above date. We will carry the following articles in our packs: One men's kit, two blankets, 1 extra suit underwear, one winter cap, one pair wool mitts, one shelter half, five tent pins, one stake, one knife, fork and spoon, one condiment can, bacon can, raincoat, all toilet articles, one towel. We also have a mackinaw to carry, which totals the weight to be carried about 45 pounds. I think we will also have three or four days' rations to carry. I understand there will be two brigades (2000 men) leave this camp, although there will be more than that on the transport. They are especially built to carry troops. Each deck has had the stateroom partitions removed, making one big room, in length and width of the vessel. I look forward to a good trip, although I expect to be seasick for a time, and I suppose the danger of submarines will make it a little "spicy." Out of 10 brigades of the 20th, only one vessel has been attacked, so don't worry about me. This is war, and one must learn to watch for the bright side of things, as God knows there are so few pleasing thoughts in warfare. Was in town Sunday as the guest of a very nice lady and her family. Received the invitation to dine through the Y. M. C. A. I enjoyed the swell dinner served, as did the other three fellows. It was one of those regular old-style "go-to-it-fel-lows" meal, where every one felt at home and was not afraid to ask for the third slab of pie or wipe his bugler at the tablet. After we finished, they took us for a ride in their Buick Six, and that was some little ride, as I was lucky enough to draw the corner of the rear seat next to the little "queen of the May." Yes, she entertained me, so much so, that her mother, I think, lost a little confidence in the "sweet young thing." Got home just at 12 o'clock midnight, and after such a pleasant day, with such nice people, I felt like I had been sentenced to the pen for life, when I walked to my tent. Thank the Lord, I won't have to stay in the army the rest of my life. One of the most pleasant thoughts I have is of the liberty a fellow can enjoy after being discharged. A fellow gets the feeling that he is working all the time, and every minute expecting some one to tell him to do this or that, which is generally the case. A fellow always resents being commanded at first, but after he realizes he has to obey, you take and obey them mechanically. I invested $4 or $3 in supplies payday, consisting of tobacco, cigarette papers, tooth paste, shaving cream, sweet chocolate, etc. The chocolate was recommended by our captain as a refreshment during long marches. It does brace a fellow lots. They are strict about our personal appearance. Must always be shaved clean, and teeth always washed. Got out of a good long hike this afternoon on account of dentist work. The hikes are for our own good, physically, but, believe me, whenever any of us can get out of it, we sure do. A number of fellows from our company have been sentenced lately for A. W. O. L. (absent without leave), the penalty for which is a fine of from $5 to $10 per month out of their pay for three or four months, and restricted passes. Tell you about me. I obey rules, for I want to leave the service with a clean record, if I can. Some fellows, as you know, do not care, and just such men are the ones who placed the soldiers of the army before the war in such a bad light in the public eye. Our camp, as the name implies, is located on the grounds of the American University, the buildings of which are made of stone and are very attractive. Experiments are going on daily under the supervision of the college men and scientists from all over the country. Bomb and gun reports come from the woods a mile or more from here every day, which give us a slight idea of the sounds of the battlefields over there. They are perfecting a projectile now, which when shot from a gun, strikes, bursts and sends a trail of fire along the ground, killing and burning everything within reach. It is called "liquid fire," and authorities claim it will be a success. If it is, you can imagine how terrible it will be. 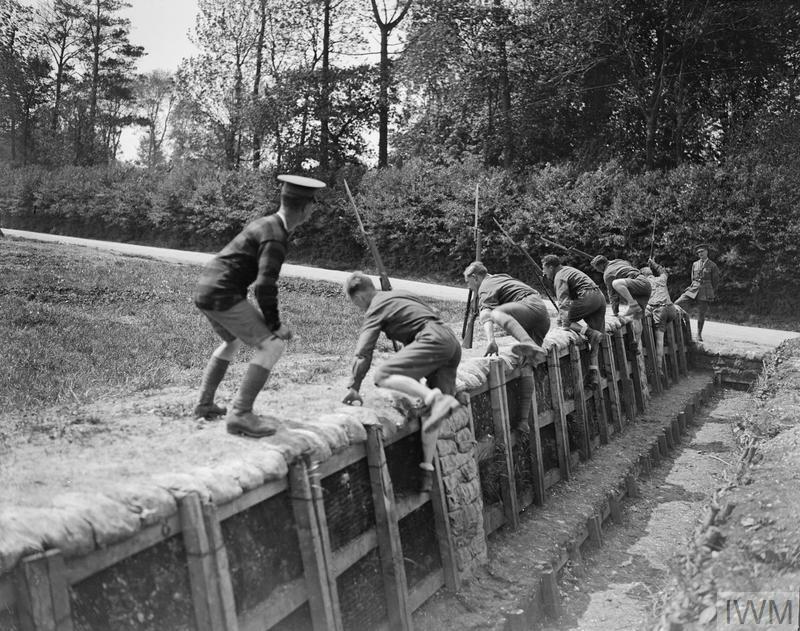 During the Bond campaign, which ended in Washington last night, some soldier boys who have had six months duty in the trenches were the center of attraction. They were looked upon as heroes, of course, and got a grand reception. I was lucky enough to be in town and saw them and heard them tell of some of their experiences. Judging from their tales the Germans' way of handling prisoners must be terrible. Do not forget how I told you to address my mail, and do not send me anything in a package, as an order has been issued that overseas men cannot get anything through the mail unless the articles he desires have been previously written for and approved of by the captain. So anything I may happen to write for you are free to send so far as the authorities are concerned. They examine each package, so you see how strict they are. Conditions are not bad in France, as they are sometimes reported, so far as the soldiers' welfare is concerned. A fellow in camp here received a letter from a friend who has been over there for five months, and he said everything possible is provided for the comfort of the boys, the only thing lacking is American tobacco, and even that is being shipped in large quantities. The Durham Tobacco Company's factory, as you know, has been taken over by the government, and the entire output goes across. The French tobacco. I understand, is so strong that, an American tobacco user can hardly smoke it. It is about time for retreat, so will have to stop and get ready to "fall in." I don't suppose the mall service is very good between Oregon and France, but I will write as often as I can and I want you to please do the same. I guess it will take at least a month for a letter to reach you, so you see they will be far between. Write good long ones and tell me all the news, not only of Ashland, but any important happenings in the dear old U. S. A.
Co. F, 10th Bri., 20th Regt. Eng. A. E. F., via New York. From the Imperial War Museum, May 21, 1918. 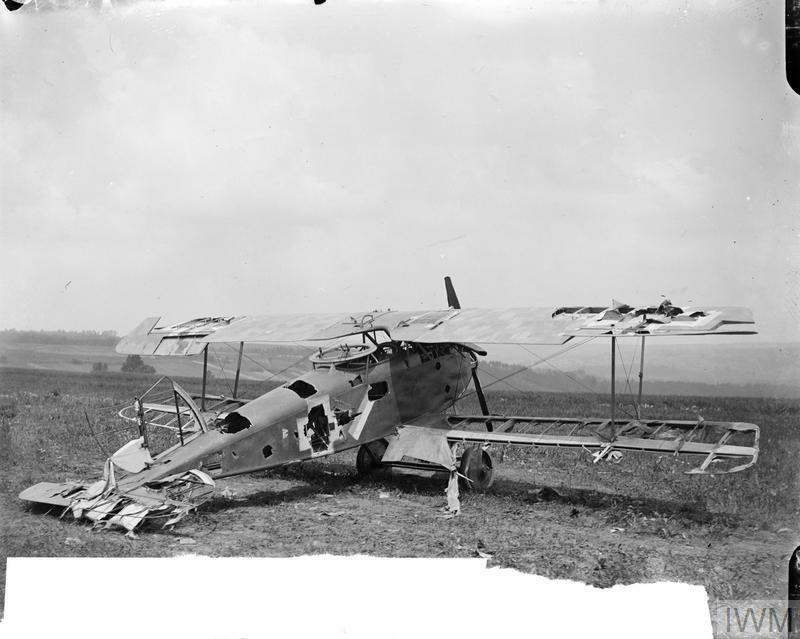 A Gotha GV crashed on the East Coast after being forced down by anti-aircraft fire at Little Wigborough, Essex. Her captain and crew were captured after they tried to set her ablaze with parachute flares. Air mechanics salving the wreckage of a German Friedrichshafen G.III bomber at Villers, 21 May 1918. Note the guard with a fixed bayonet beyond it. 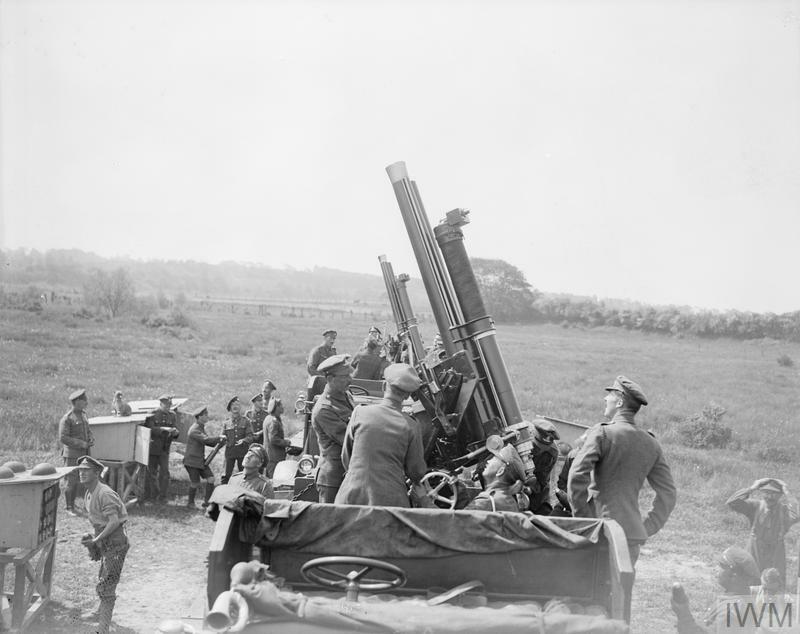 Two 13 pounder (9 cwt) anti-aircraft guns on Mark IV motor lorry mountings in action at Villers-au-Bois, 21 May 1918. Corporal Albert William Davis 5792. Unit: 22nd Battalion, Australian Imperial Force. 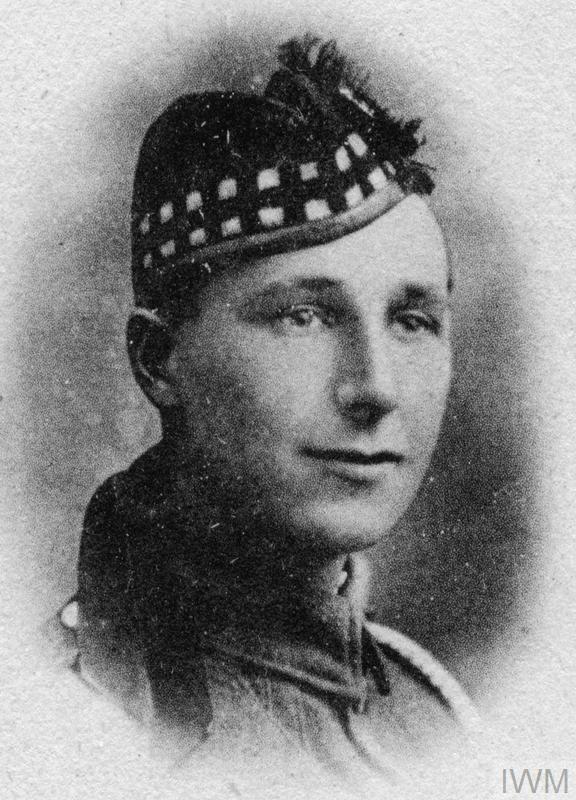 Death: 21 May 1918 Died of wounds Western Front. From the Imperial War Museum, May 22, 1918. Machine Gunners of the 77th American Division during training under the 39th Battalion, Machine Gun Corps. Near Moulle, 22 May 1918. Training of the 77th American Division with the 39th British Division. 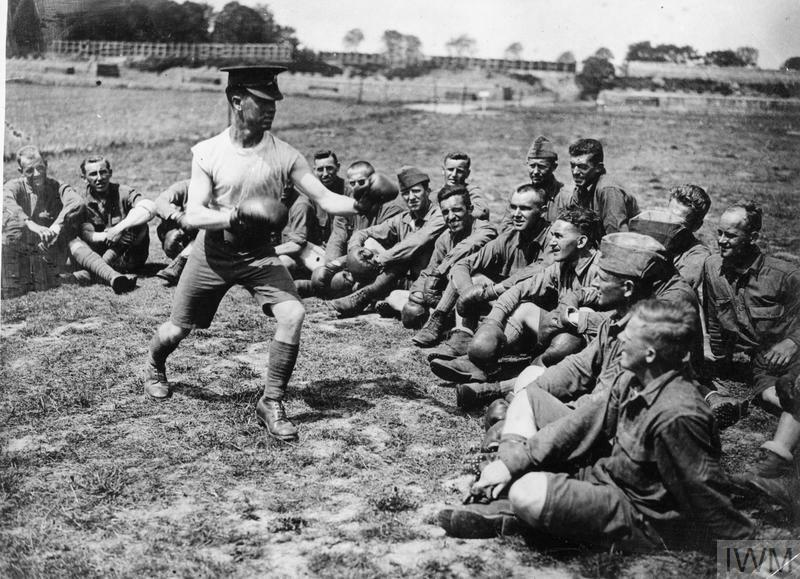 Soldier of the 39th Battalion, Machine Gun Corps instructing American troops in boxing. 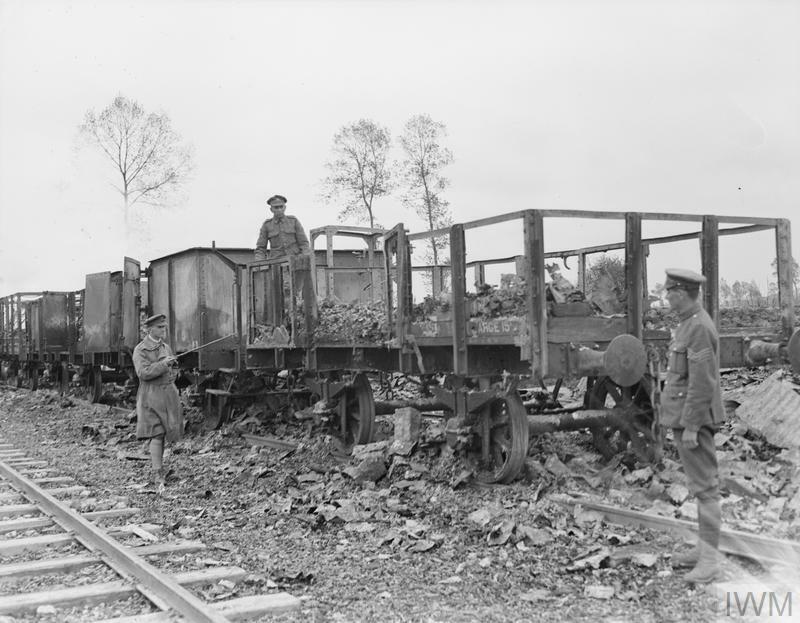 Near Moulle, 22 May 1918. Training of the 77th American Division with the 39th British Division. Soldier of the 39th Division instructing American troops in bayonet fighting in trenches. Near Moulle, 22 May 1918. 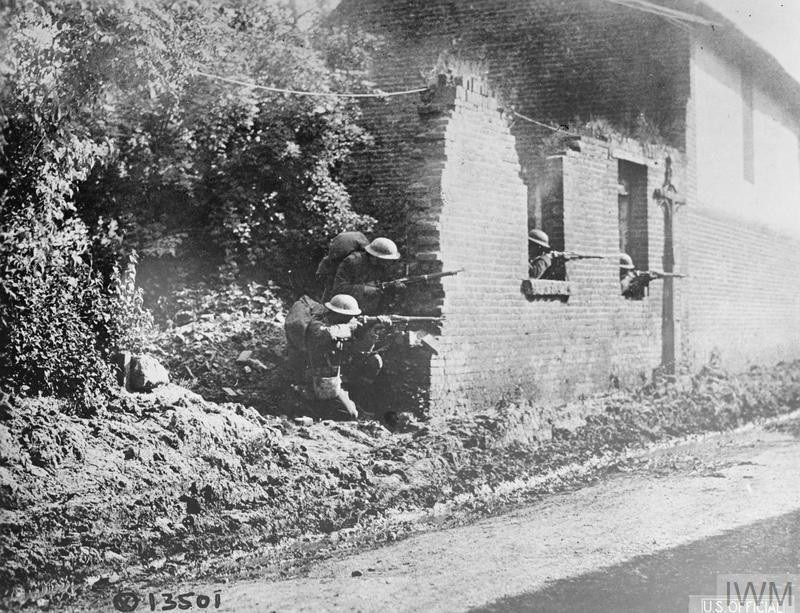 Troops of the American 28th Infantry Regiment firing at the enemy from a ruined house at either Bonvillers or Mont-Bonvillers, 22 May 1918. Lieutenant Henry Eric Hammel. Unit: 11th Reinforcements, 2nd Field Company, 1st Divisional Engineers, Australian Imperial Force. Death: 22 May 1918, died of wounds at 14 General Hospital, Western Front. Son of Frank and Emily Jane Hammel, of "Carinya," 73, Barkley St., St. Kilda, Melbourne. From the Europeana Collection, May 22, 1918. Photograph of soldiers on motorcycles and sidecar in Gournay-sur-Dovetail (Oise) on 22 May 1918. From the Library of Congress. The Seattle Star, May 22, 1918. From the imperial War Museum, May 23, 1918. 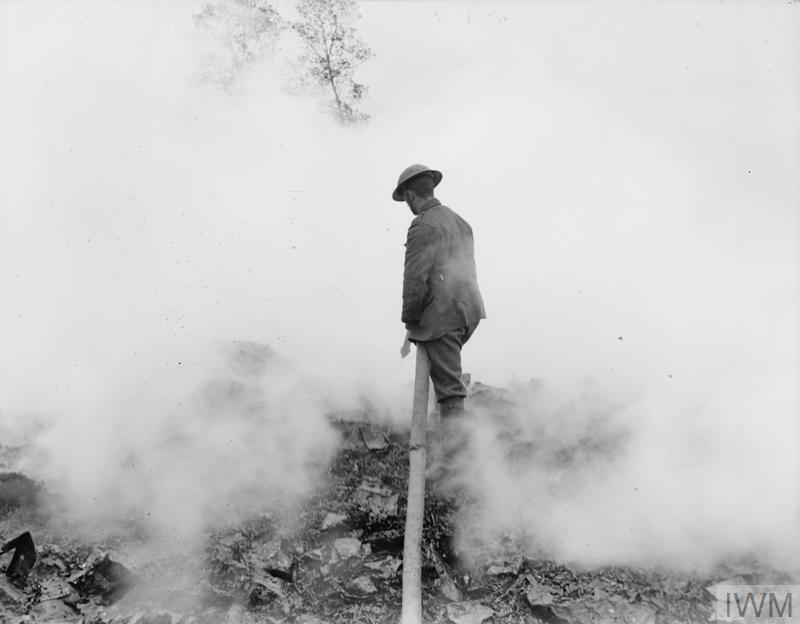 British soldier extinguishing the fire at a cartridge dump at Saigneville, 23 May 1918. Private Charles Edward White 3169. Unit: A Company, 34th Battalion, Australian Infantry, Australian Imperial Force. 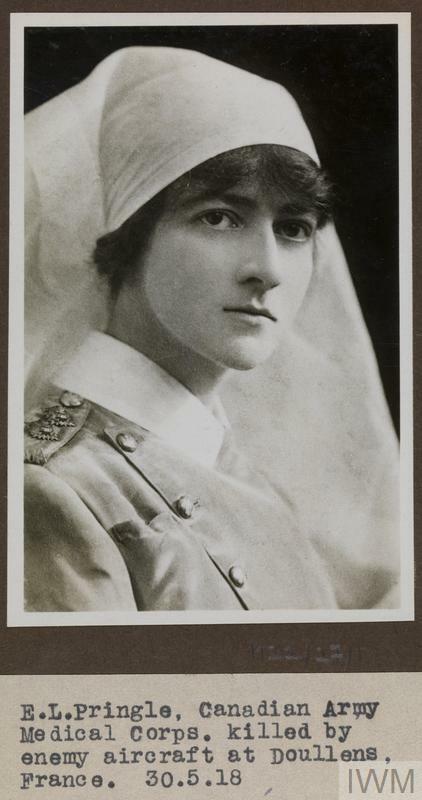 Death: 23 May 1918. Died of wounds in King George Hospital London. Son of James and Ada Minnie White. Native of Yass, New South Wales. Age at death given as 20. The results of a horse race that took place on May 22, 1918. The horse I would have bet on, War Note, came in last. Yeah, I know. I also liked the horse named IWINIWIN but she came in fifth. War Note fell down, I noticed. I hope she was ok.
From the Imperial War Museum, May 24, 1918. 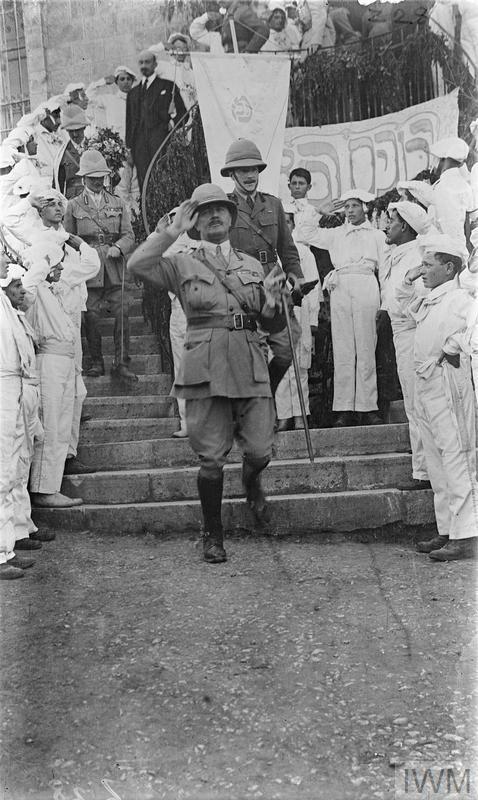 Field Marshal Edmund Henry Hynman Allenby leaves his reception in Jerusalem, courtesy of the Jewish community, as he is saluated by members of the Makkabi Athletic Association (Jewish Boy Scouts), 24th May 1918. 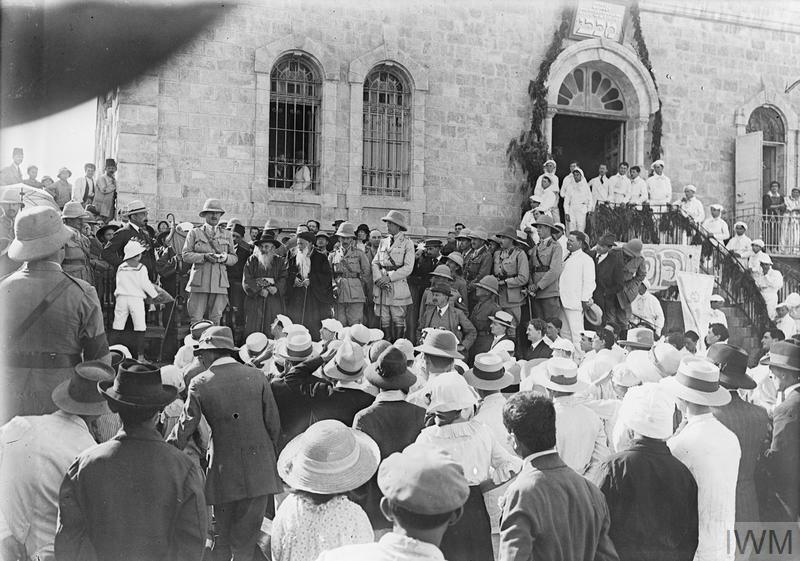 Field Marshal Edmund Henry Hynman Allenby making a speech at his reception, in Jerusalem by the Jewish community, after being presented with a casket containing the Scroll of the Law, 24th May 1918. From the Library of Congress. 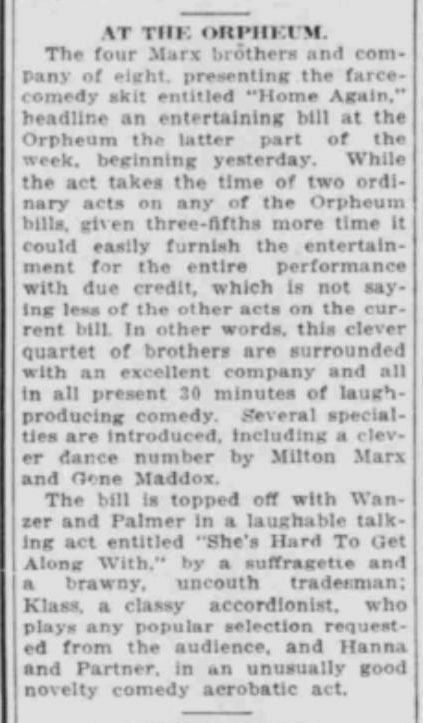 The Rogue River Courier (Grans Pass, Oregon) May 24, 1918. Corvallis, May 24. A post office robbery last night at Alsea, which netted the robbers a little over $250 in cash and thrift stamps sent Major Delch with a squad of 12 state police to the little mountain town about 22 miles southwest of here today in the belief that the trick had been turned by Jeff Baldwin. Several hours spent in the locality, however; convinced Major Delch that the robbery was not the work of Baldwin. Deputy Sheriff Taylor, who also visited Alsea is of the same opinion. From the Imperial War Museum, May 25, 1918. 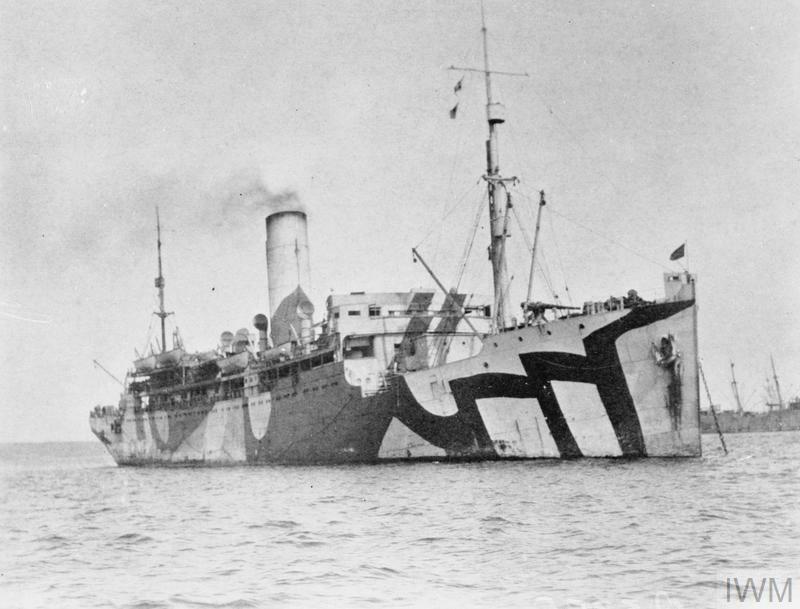 Dazzle-camouflaged American transport ship USS Pastores arriving with American troops in Brest, 25 May 1918. 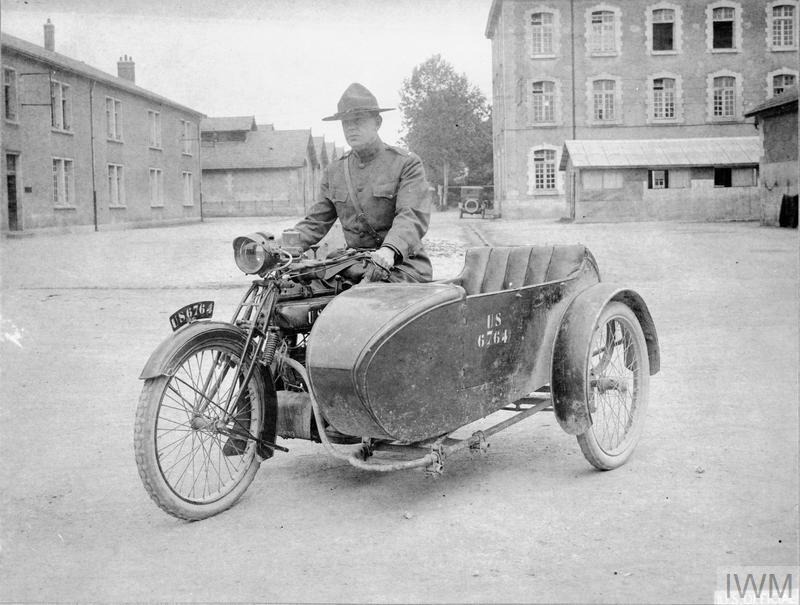 An American officer on a Rover motorcycle with a sidecar (English type) at Tours, 25 May 1918. 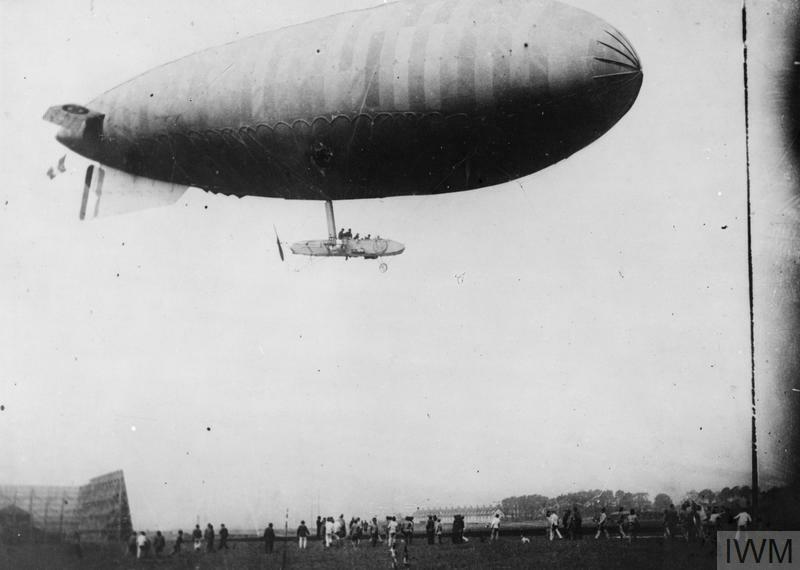 A French airship of the Eclaireur Zodiac class manoeuvring for its descent at Les Marquises aerodrome, Boulogne-sur-Mer, 25 May 1918. 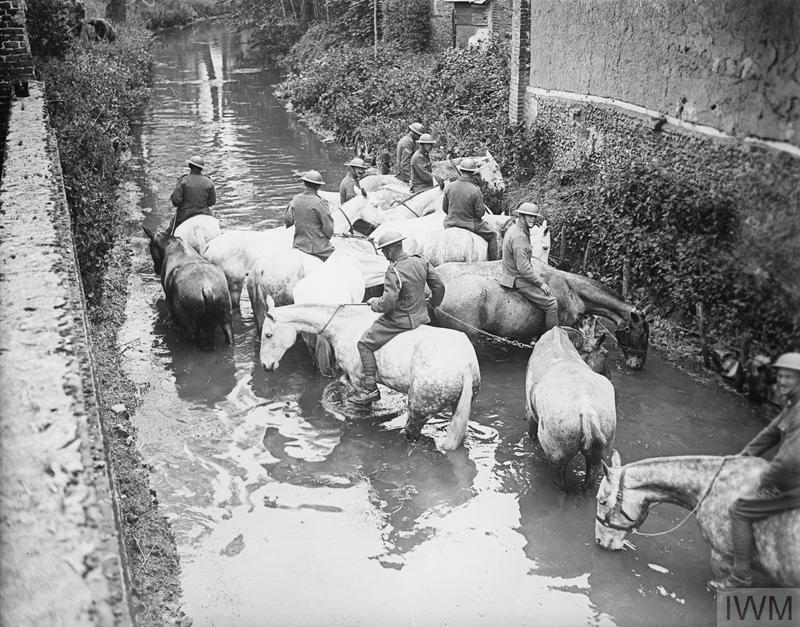 The Royal Scots Greys watering horses at Brimeaux, 25 May 1918. 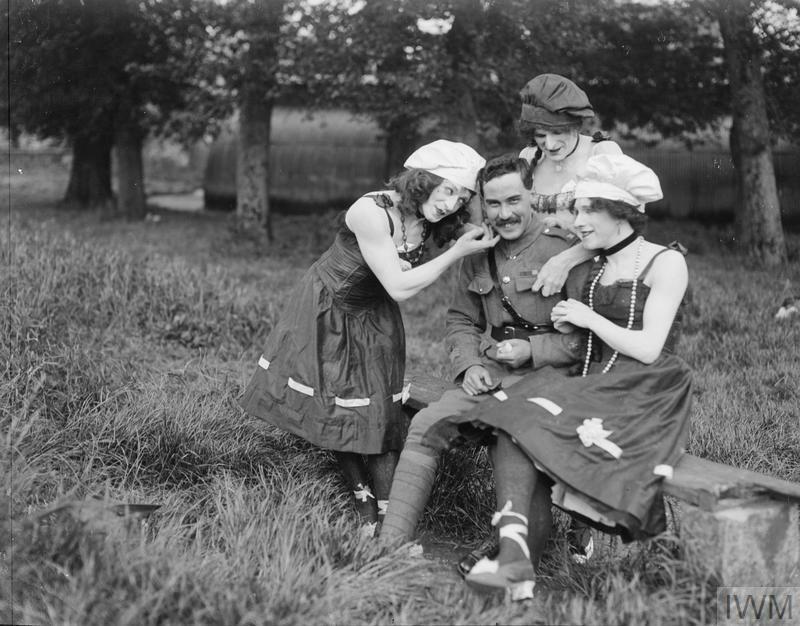 Members of the concert party named The Queerios at GHQ at Montreuil-sur-Mer, 25 May 1918. 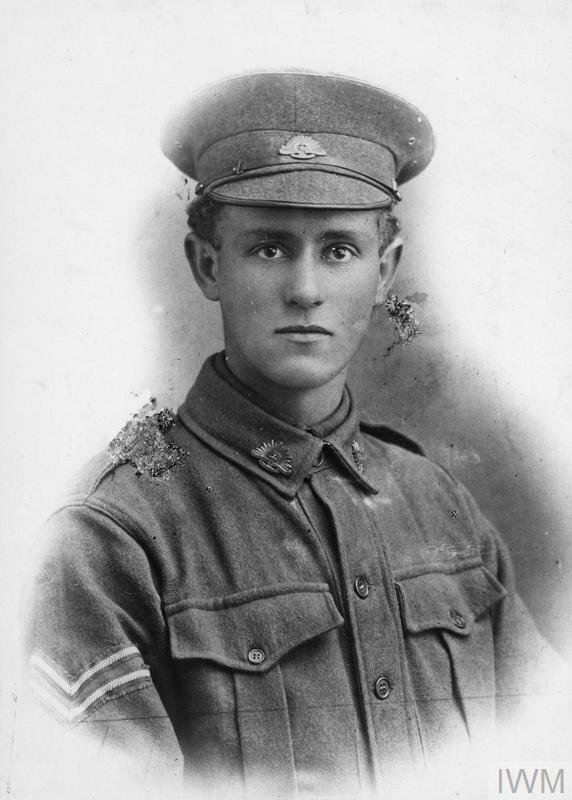 Private Robert Gorrill 122903. Unit: 25th Battalion, Machine Gun Corps (Infantry). Death: 25 May 1918, Western Front. Commemorated on the Soissons Memorial. Son of Robert and Florence Gorrill, of 97, Blair Athol Rd., Sheffield. That is wild. 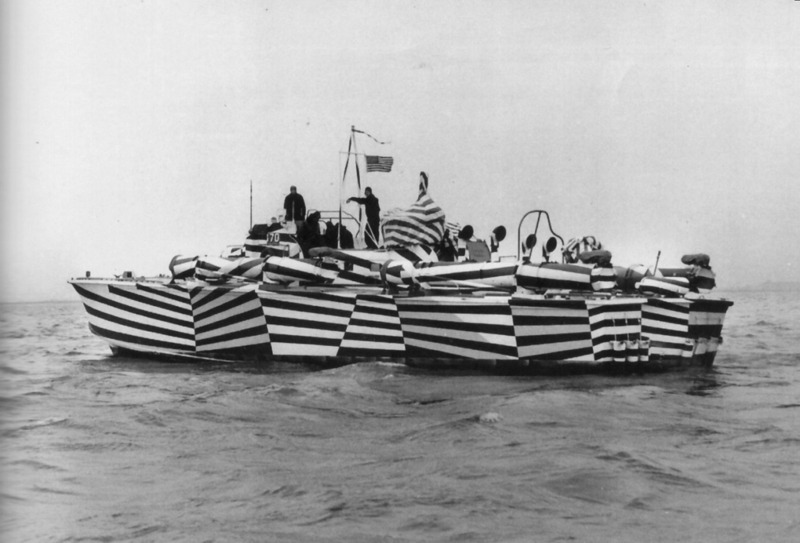 Someone I was not aware of "Dazzle Camo," but a lot of ships used it and some are quite wild. The intention was not to conceal ship but make ranging the ships by the enemy harder. Ha, never in my wildest dreams could I look at that ship and think that it was smooth sided. I wonder if the painters got dizzy? With the cheap 'wrapping' these days I'm tempted for one vehicle. On a lark. Would it be legal though? It would really mess with other drivers and I'd likely get run into. Or even exhibit drunk-driving behavior simply from looking at my truck before driving! Or maybe it would confuse drivers and cops and I could beat traffic? That stuff is wild! From the Imperial War Museum, May 26, 1918. 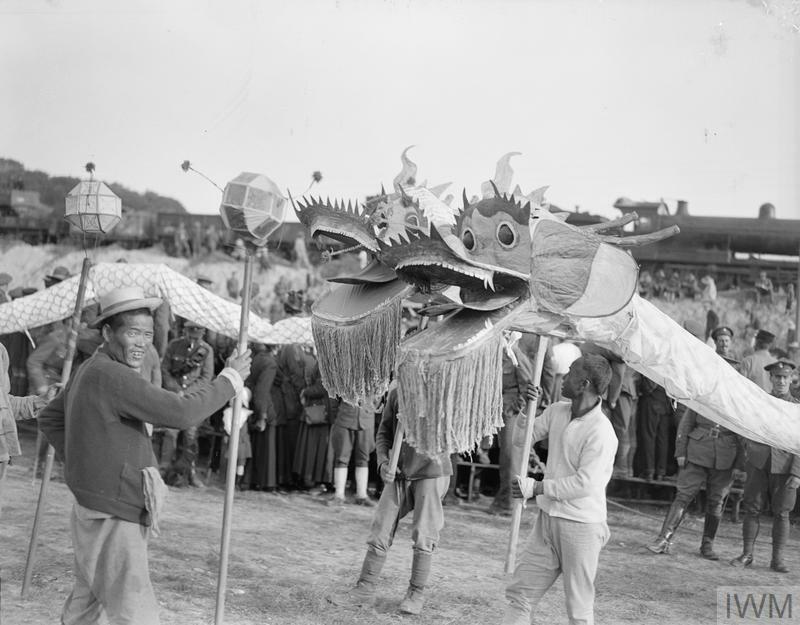 Chinese actors entertaining an audience of British and American soldiers, local inhabitants and Chinese workers at their camp at Samer, 26 May 1918. Two dragon processions ready for the fight. 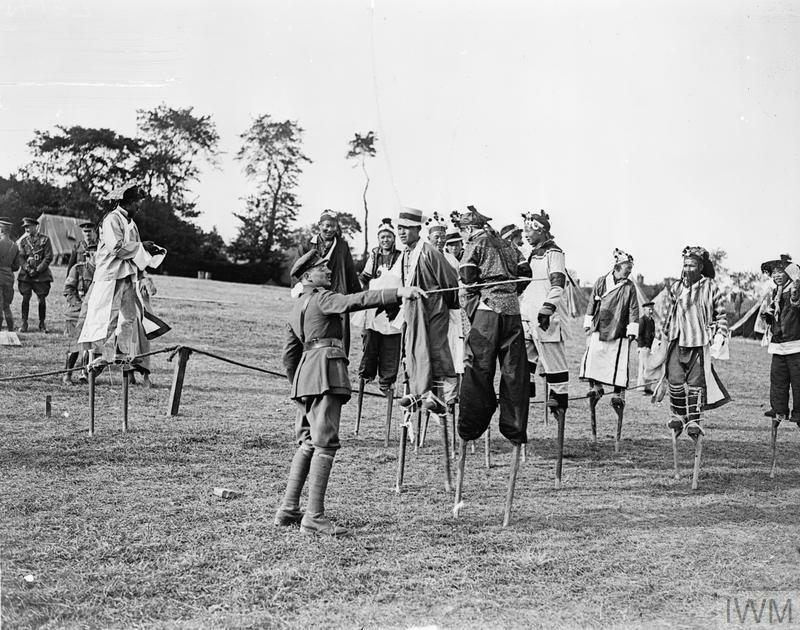 Chinese stilt-walkers entertaining an audience of British and American soldiers, local inhabitants and Chinese workers at their camp at Samer, 26 May 1918. 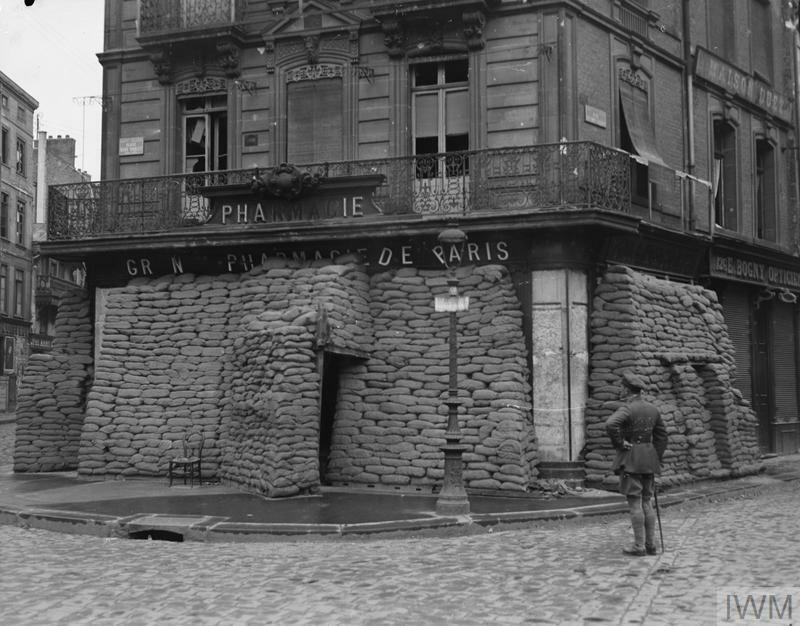 A pharmacy (Grand Pharmacie de Paris) in Amiens with the windows completely protected by sandbags, 26 May 1918. From the Library of Congress. The South Bend News-Times., May 17, 1918. From the Imperial War Museum, May 27, 1918. 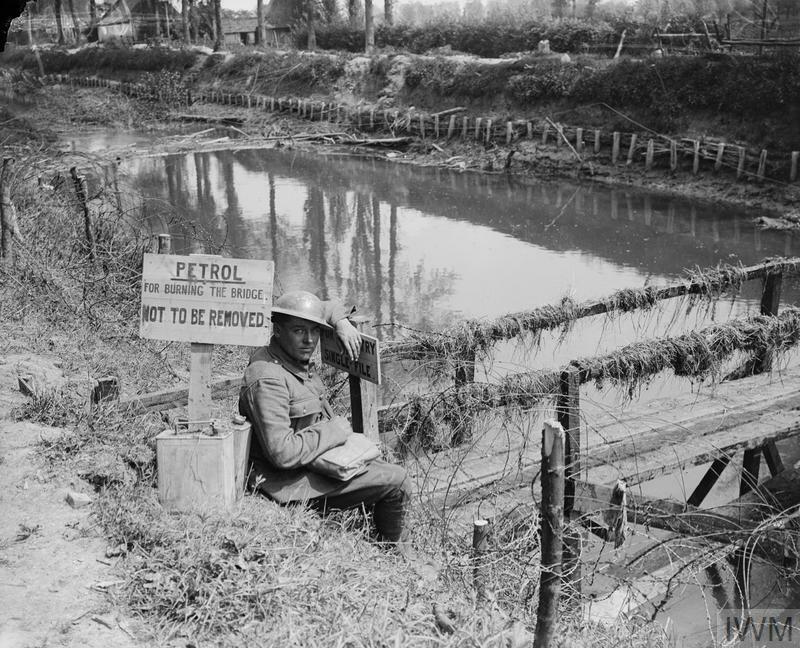 A petrol dump at Beaurainville, 27 May 1918. 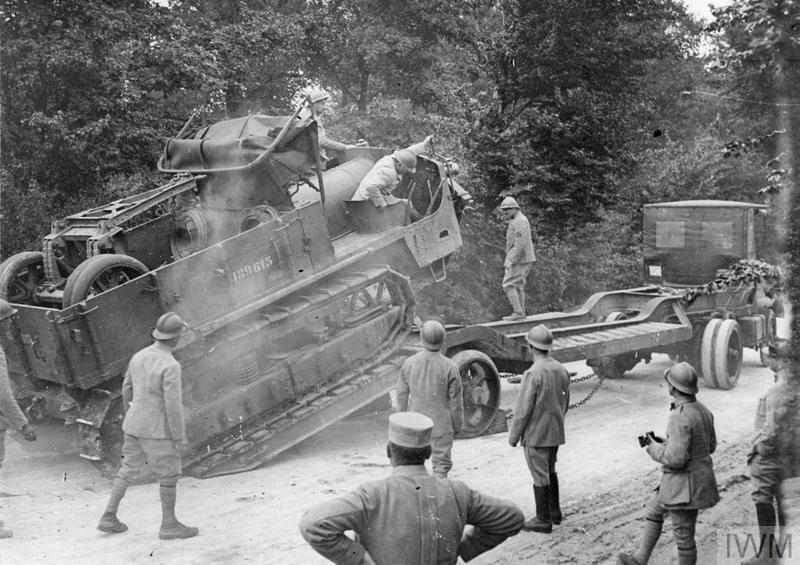 A French artillery caterpillar mounting on to a Knox tractor by its own power. 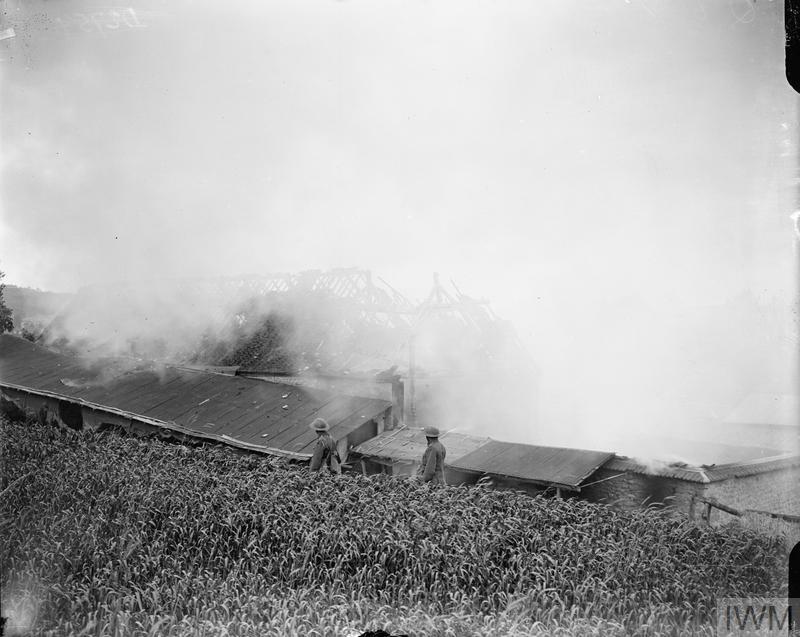 Meuse, 27 May 1918. The Third Battle of the Aisne. 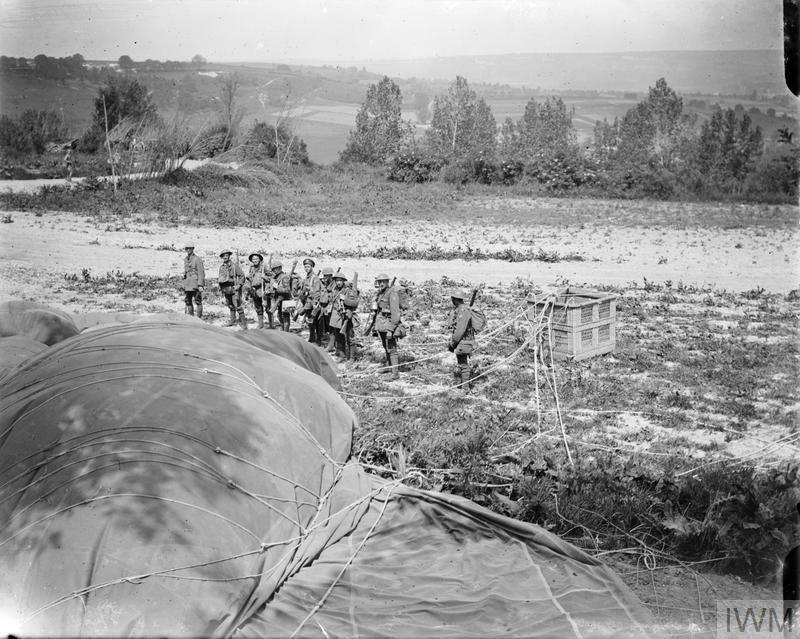 British troops passing a French observation balloon brought down after an hour's attack within 400 yards of the enemy. 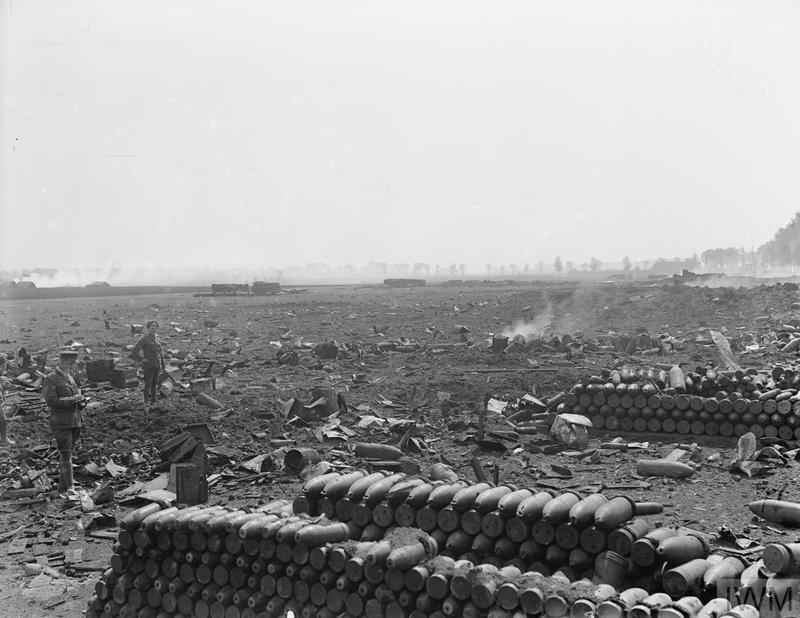 Muscourt, 27 May 1918. 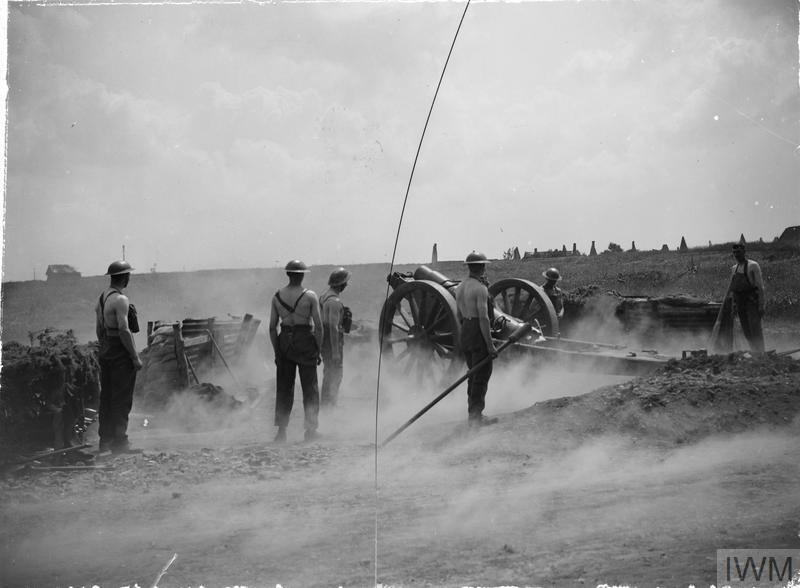 6-inch 26cwt howitzer battery of the Royal Garrison Artillery at recoil after firing. Near Achicourt, 27 May 1918. The Third Battle of the Aisne. 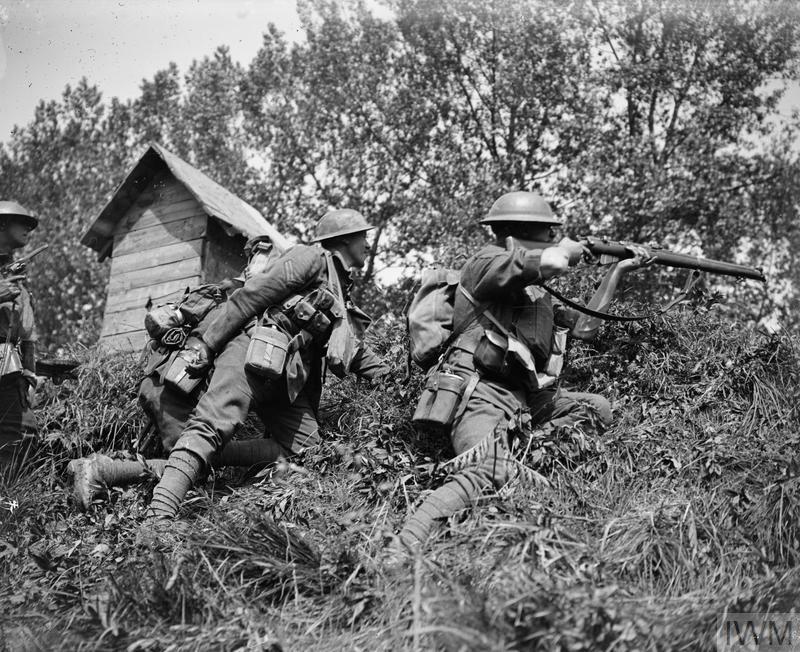 Men of the Worcestershire Regiment holding the southern bank of the River Aisne at Maizy, 27 May 1918. 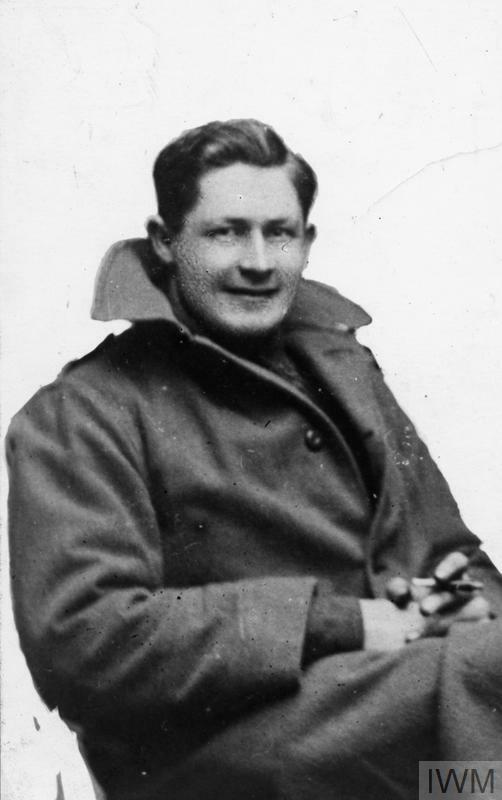 Private Ernest J Kendall 204110. Unit: Worcestershire Regiment. Death: 27 May 1918 missing in action. 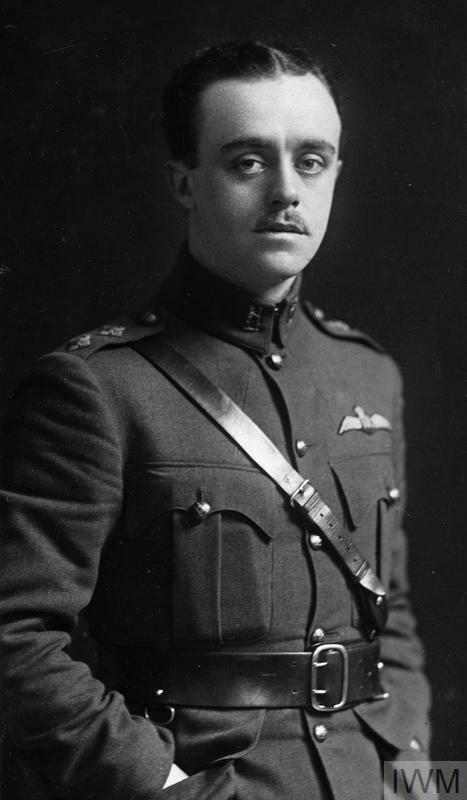 Lieutenant Paul Wrey Gardiner. Unit: 4th Battalion, Manchester Regiment, attached to the 1st Battalion, Worcestershire Regiment. Death: 27 May 1918, killed in action, Aisne, Western Front. Commemorated on the Soissons Memorial. Son of George Charles and Beatrice Mary Gardiner, of 95, Westbourne Terrace, Paddington, London. From the Library of Congress. The Tonopah Daily Bonanza, May 27, 1918. Lee Newport went to seek the services of Dr. Masterson yesterday for alleged heart trouble. The doctor not being in his office the patient dropped to sleep in his chair, from which he rolled over on the floor. A squad of boy scouts called later and found Newport, apparently very sick on the floor. "I am dying," Newport groaned and the next minute he gave another roll and fell limp after muttering "I am dead." The scouts rushed out to get an undertaker and doctor. Frank Cavanaugh was found at the K. C. doings and notified, ln turn he informed E. A. Pomeroy to hitch up his mules. Pomeroy went out and brought the dead wagon and basket to the doctor's office. Justice Dunseath was also notified to hold an inquest. In the meantime an officer from the police station, in answer to a call, and realizing the true condition of affairs, lugged Newport off to jail to sleep off his drunk. From the Imperial War Museum, May 28, 1918. The Third Battle of the Aisne. 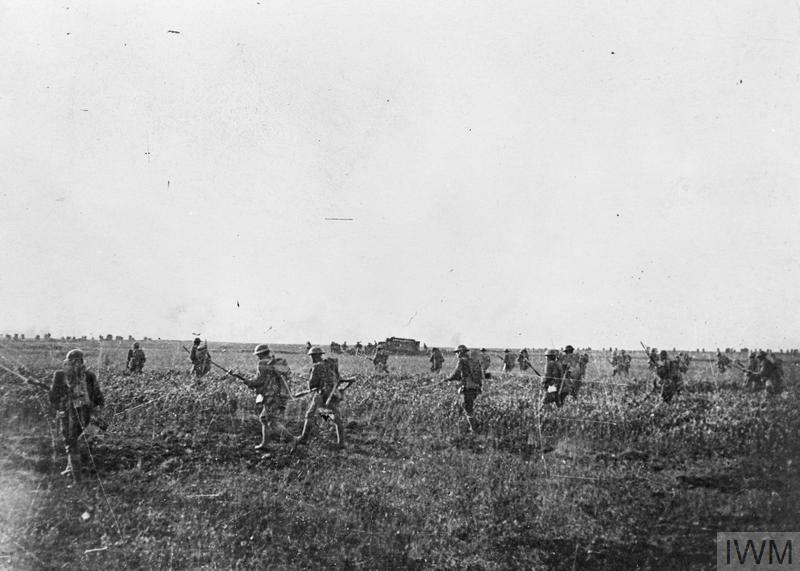 German infantry preparing to advance in extended order across open country during the assault on Fismes, 28 May 1918. 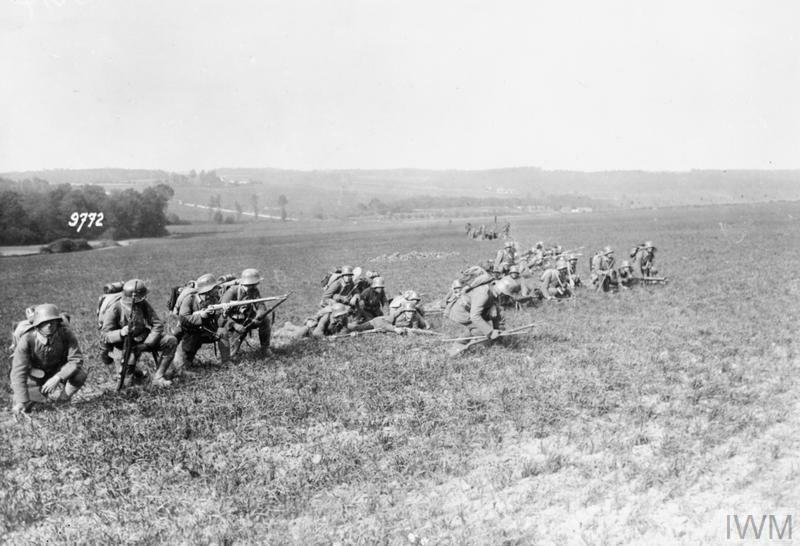 Attack and taking of Cantigny by 28th Infantry Regiment, American 1st Division supported by the French 5th Tank Battalion (Saint-Chamond tanks), 28 May 1918. The Third Battle of the Aisne. 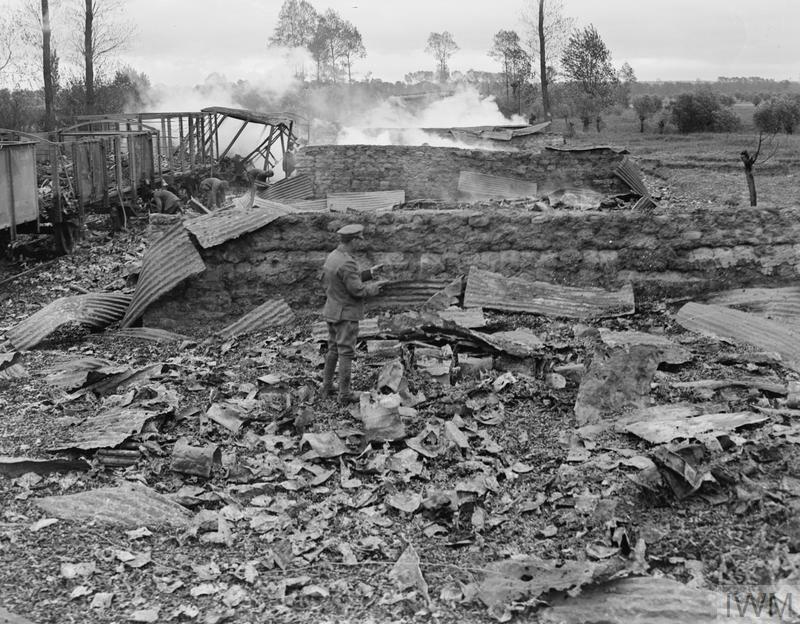 Burning buildings in Romain, set on fire by German shells, 28 May 1918. Ha! Luckily now the Boy Scouts would be better prepared since, according to the information I see in the politics thread, that condoms are required and alcohol is allowed (in some areas) at the Jamborees! From the Imperial War Museum, May 29, 1918. 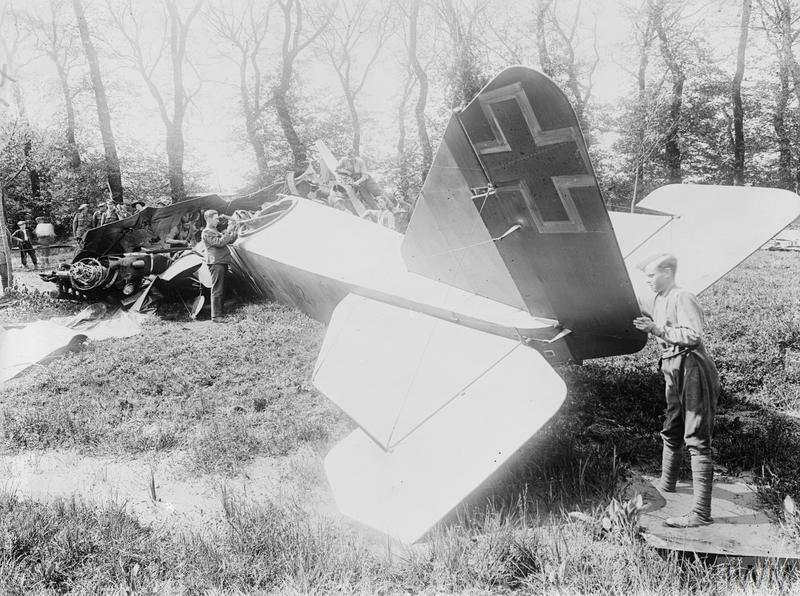 A German Halberstadt CL.II two-seat fighter biplane brought down in the British lines. 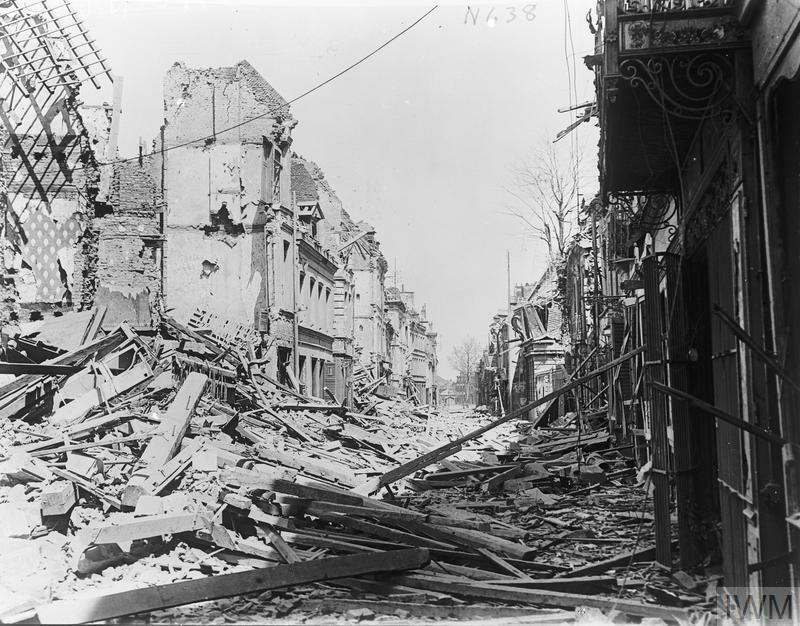 Faverolles, 29 May 1918. The Third Battle of the Aisne. French and British troops awaiting the enemy in the open. 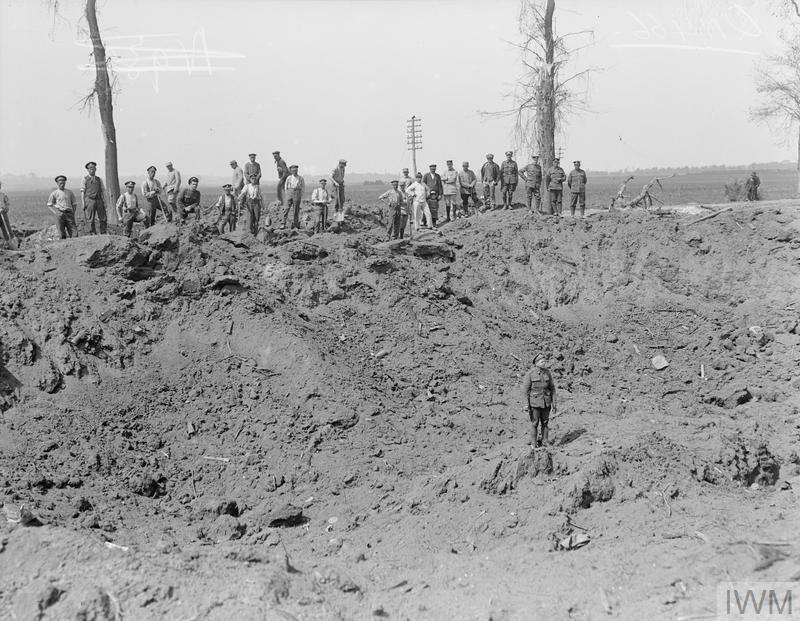 North of Courville, 29 May 1918. 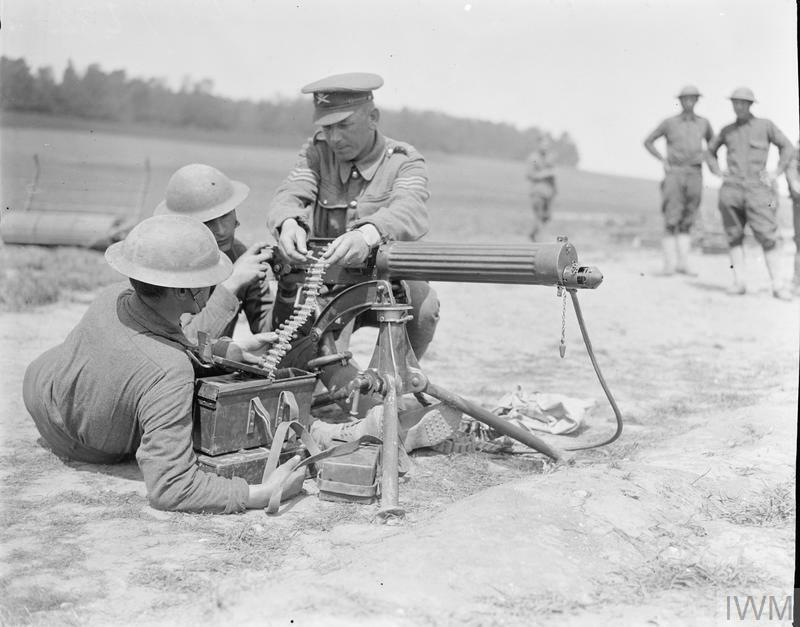 Note a Hotchkiss machine gun ready to use. 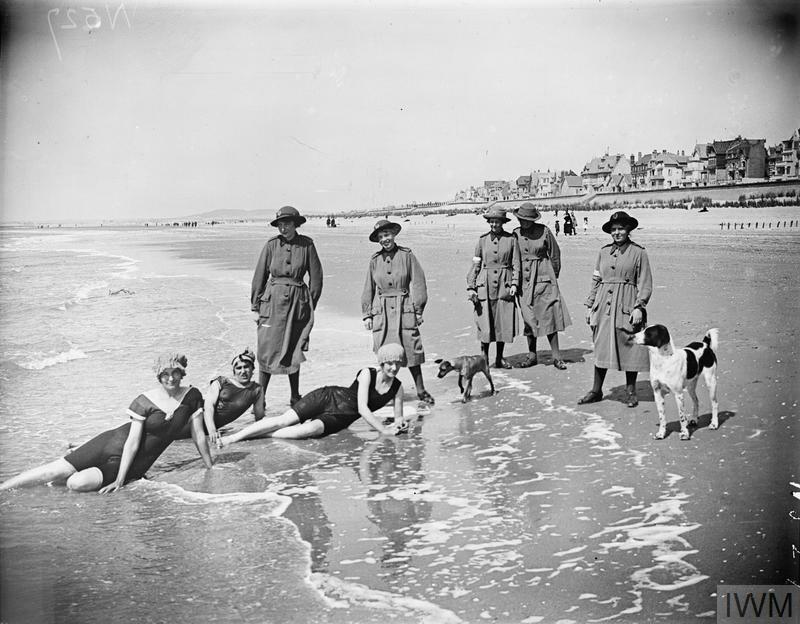 Members of the Queen Mary's Army Auxiliary Corps on the beach at Paris-Plage while on leave, 29 May 1918. 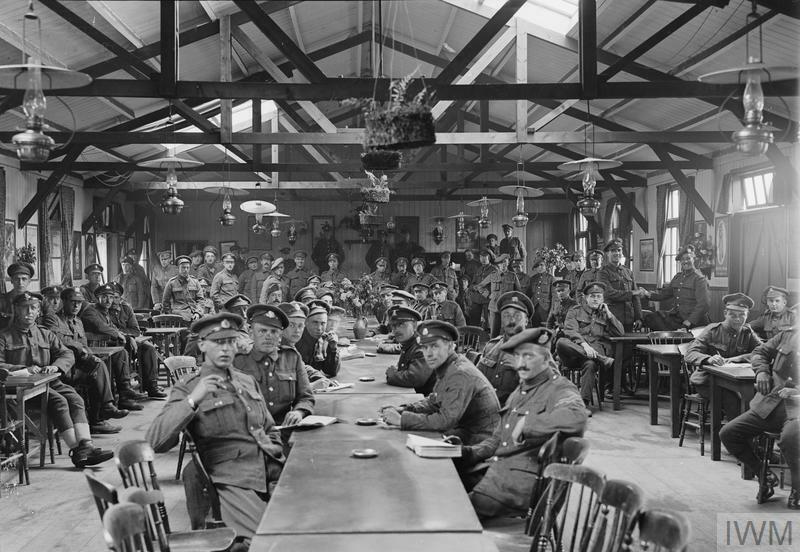 Convalescent soldiers reading books and writing letters at the Recreation Room hut of the British Red Cross at No. 10 Convalescent Camp at Ecault, 29 May 1918. 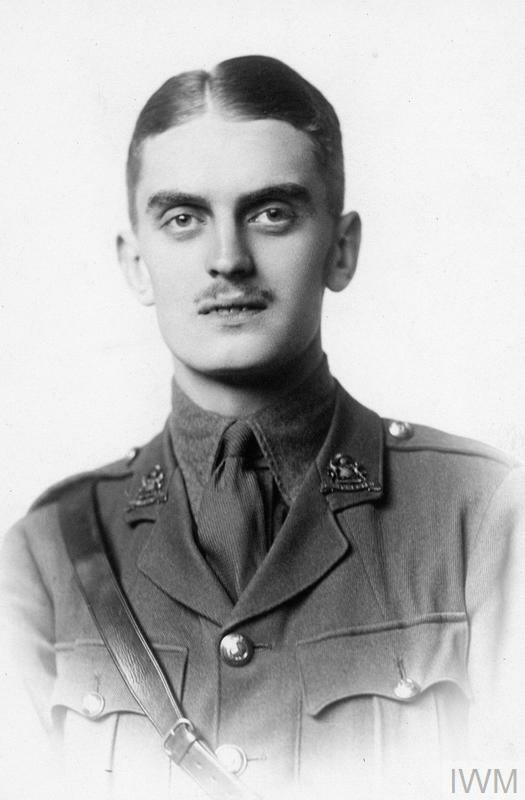 Second Lieutenant John Endell Wanklyn MC. Unit: 128th Battery, 29th Brigade, Royal Field Artillery. 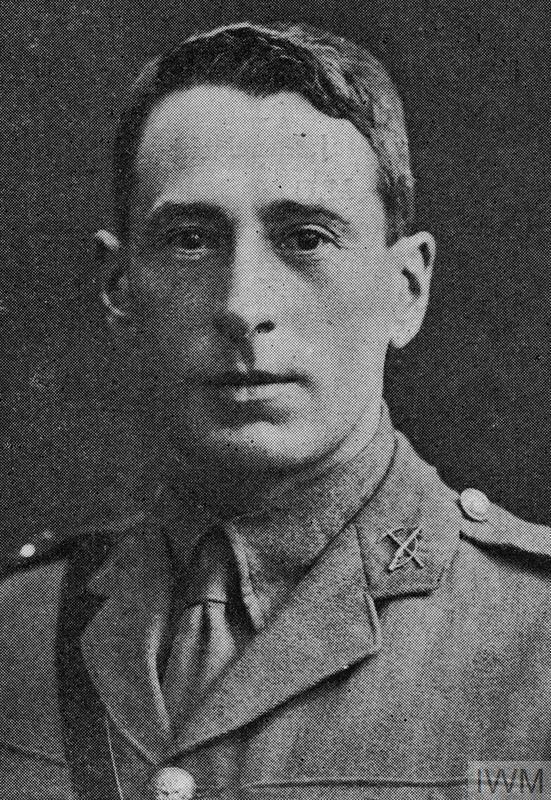 Death: 29 May 1918 Killed in Action Western Front. 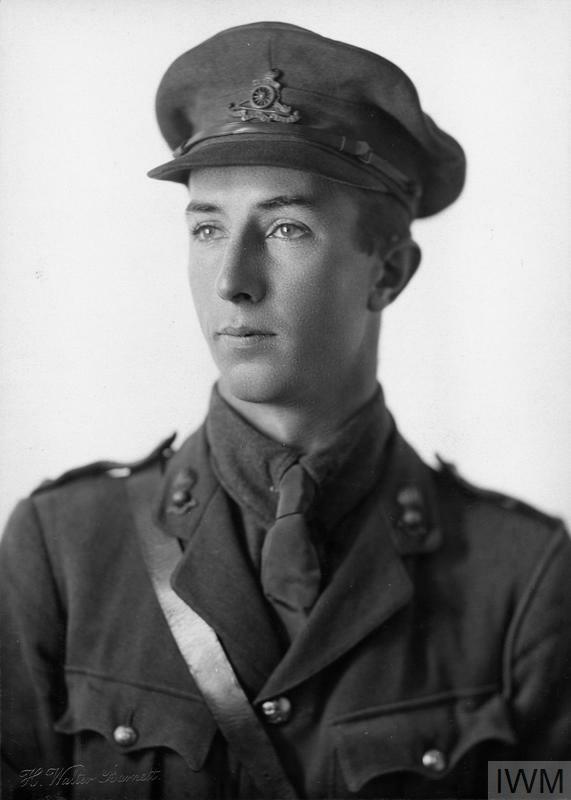 Son of William Henry Endell Wanklyn and Rose Eliza Wanklyn, of 28, Fendalton Rd., Christchurch, New Zealand. CWGC has age at death given as 22. From the Library of Congress. The Evening Star, May 29, 1918. From the Imperial War Museum, May 30, 1918. 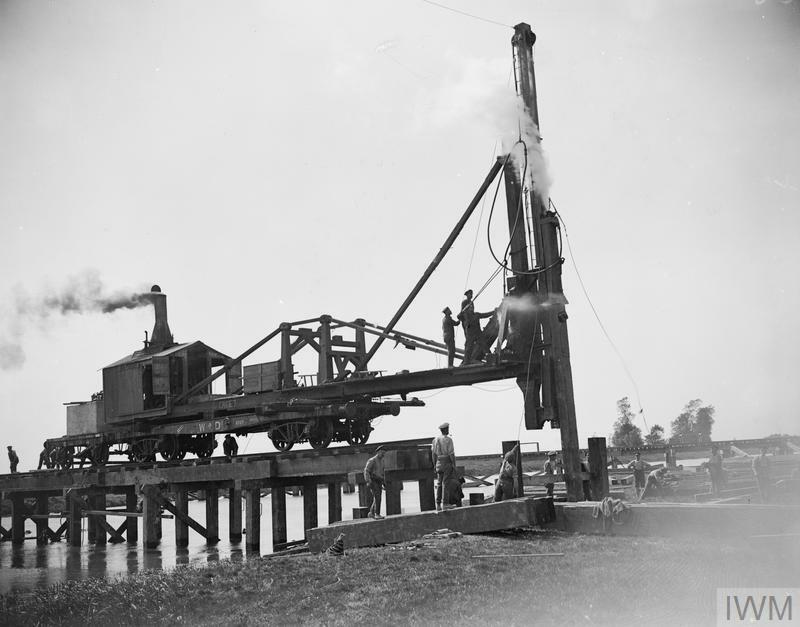 Royal Engineers using a pile-driver in the construction of a railway bridge over the Canche river near Etaples, 30 May 1918. 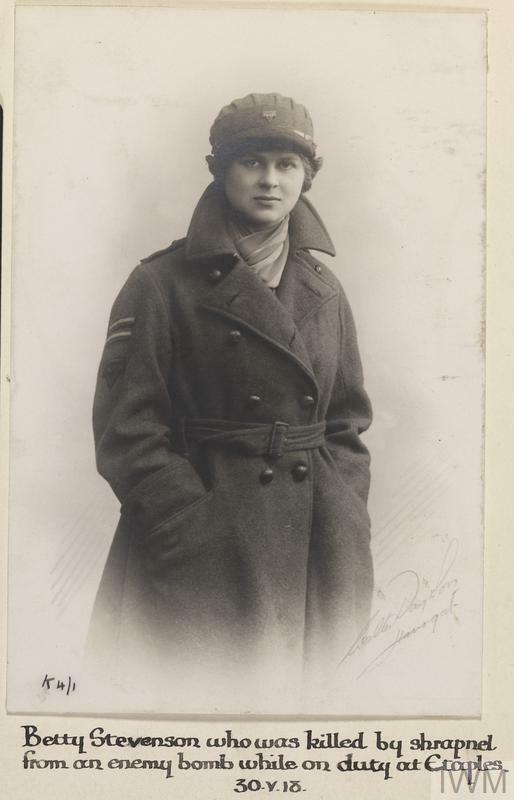 Beatrice Campbell, Queen Mary's Army Auxiliary Corps. Killed at Abbeville by an enemy bomb 30 May 1918. 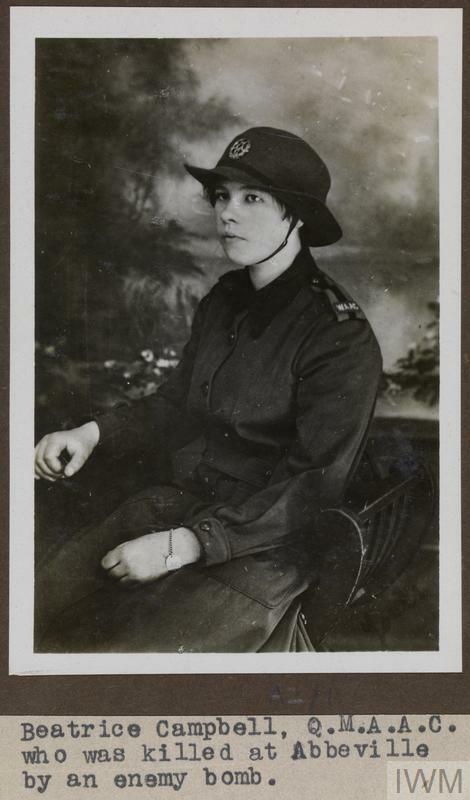 Miss Ethel Frances Mary Parker, Queen Mary's Army Auxiliary Corps. Killed at Abbeville by an enemy bomb 30 May 1918. Betty Stevenson, Young Men's Christian Association. Killed by shrapnel from an enemy bomb on duty in Etaples 30 May 1918. 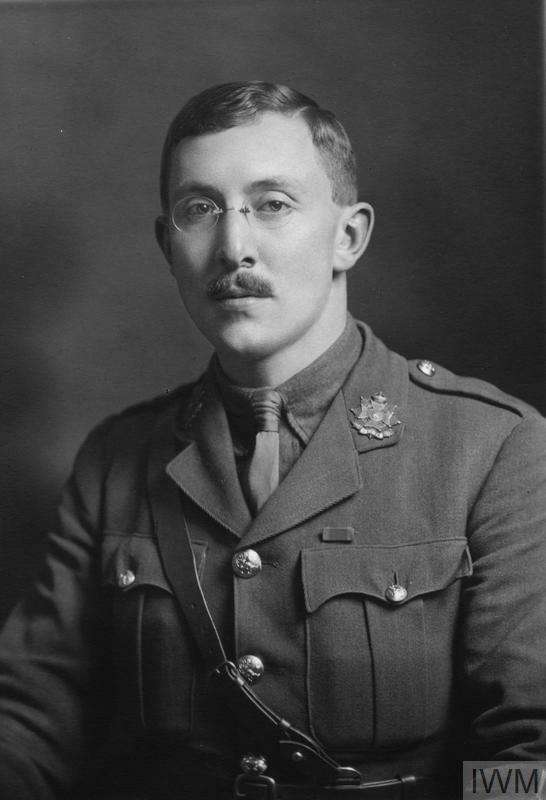 E L Pringle, Canadian Army Medical Corps. Killed by enemy aircraft at Doullens 30 May 1918.